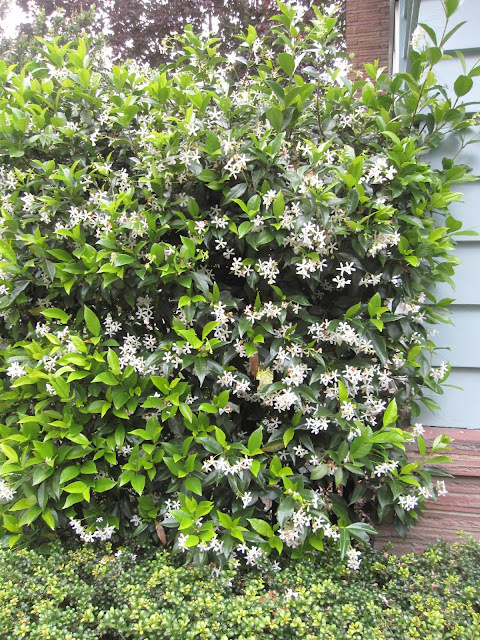 For the first time in many years, I missed posting for last month's Bloom Day. Surprisingly (at least to me) there were more May flowers in my garden than there are now in June. Let's see what's still happening out there this month in a color survey of Longview Ranch, starting with white. 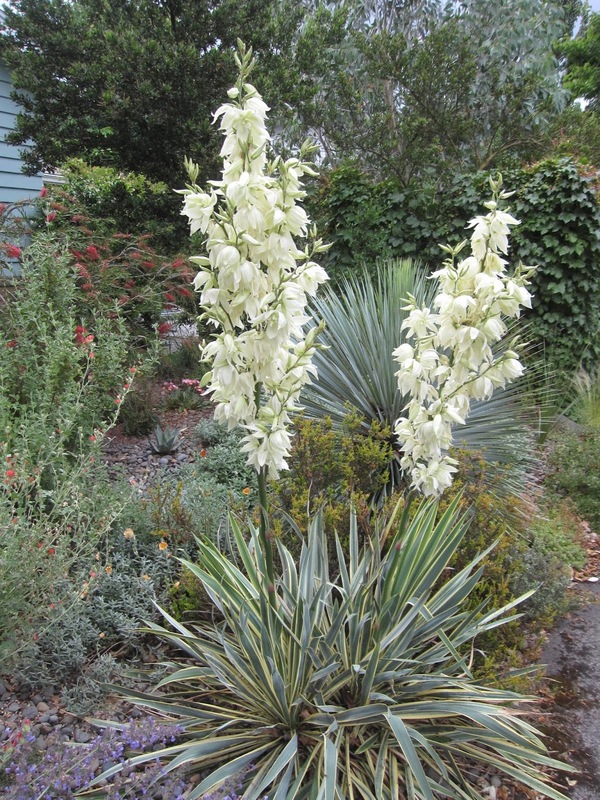 Yucca filamentosa 'Bright Edge' has two lovely flower stalks. Usually, these bloom out very quickly, but with our cooler weather, they have lasted for weeks and look good to continue for a while. Yesterday, I was astounded to see that Lagerstroemia 'Natchez' has begun to flower. 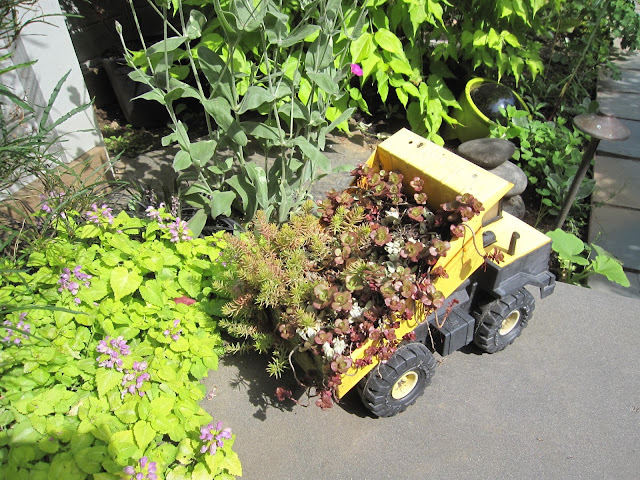 I hope it saves a little excitement for the rest of summer. 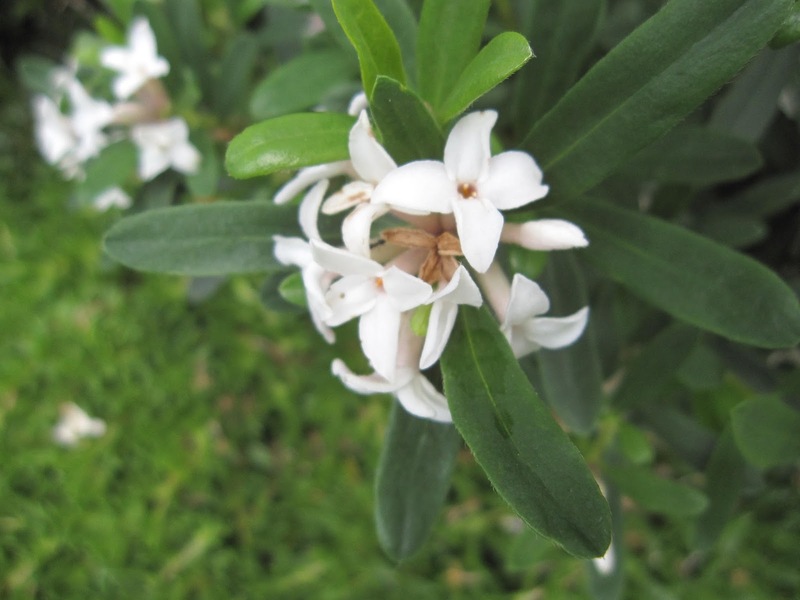 In other white-flowered news, Daphne transatlantica 'Eternal Fragrance' continues its non-stop bloom. 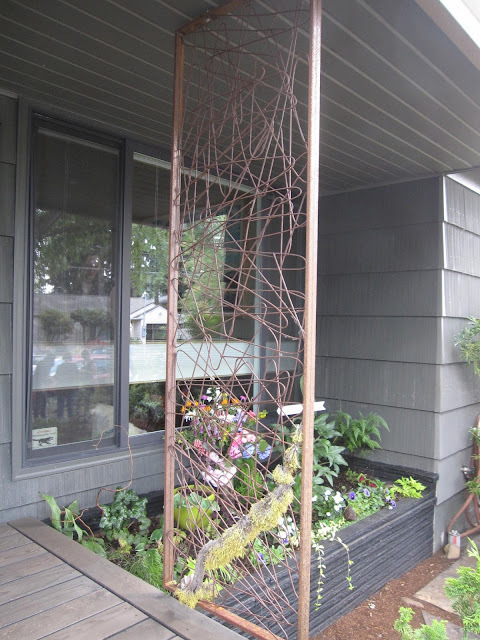 I don't understand it, but I'm not complaining. 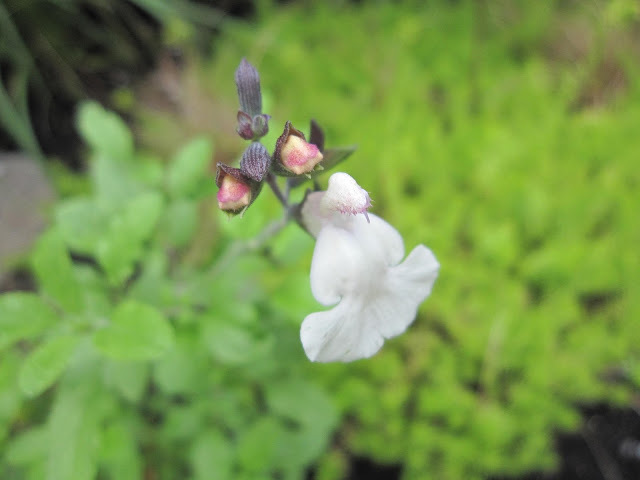 The first flowers on a pure white Salvia, Heatwave Series 'Glimmer' from Heather at Just a Girl with a Hammer. 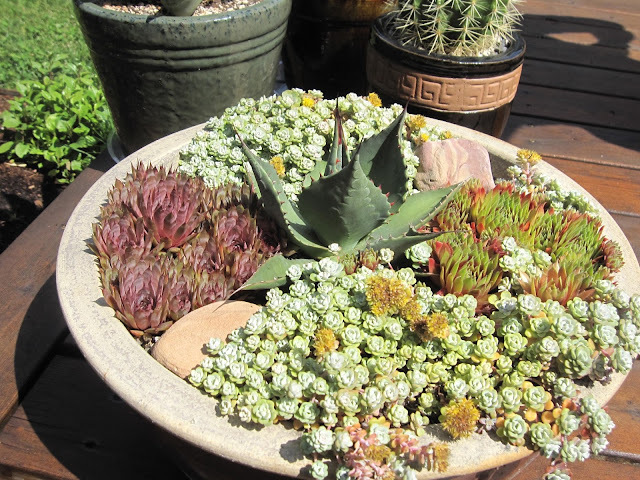 Thank you, Heather - I'm loving it! 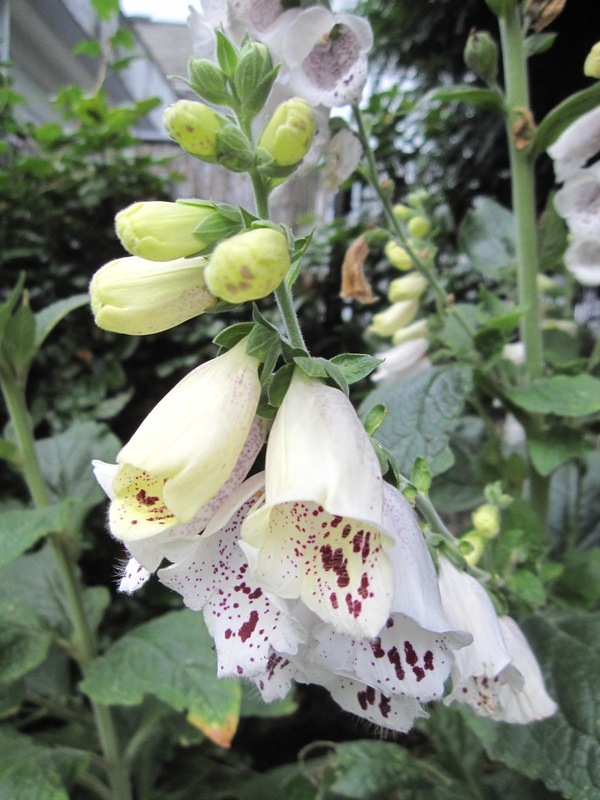 Digitalis volunteered in the garden years ago, and looks great in the "Northwest Territory" of Longview Ranch. Digitalis isn't native to the PNW, but it's been naturalized here for so long, many people assume it is. 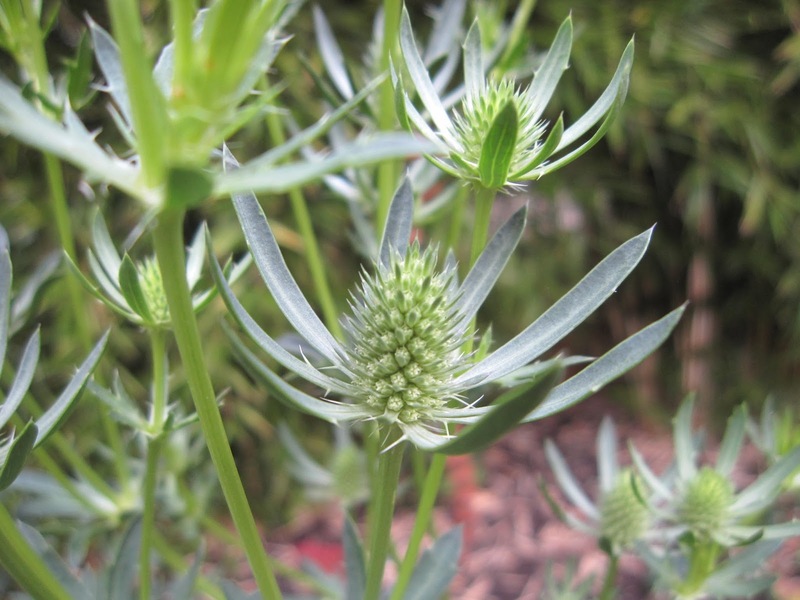 I grow this Syneilesis hybrid for its fascinating "shredded' leaves, but I don't have the heart to cut off the odd blooms when I have so little else yet in the new bed it occupies. Trachelospermum jasminoides 'Confederate Cream' creates privacy for our back garden and looks pretty nice doing it, too. 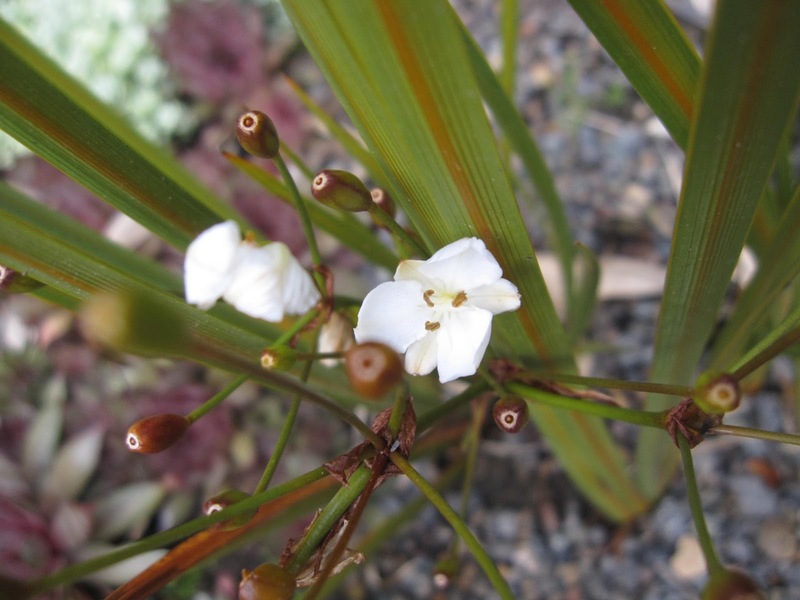 Libertia peregrinans 'Bronze Sword'. 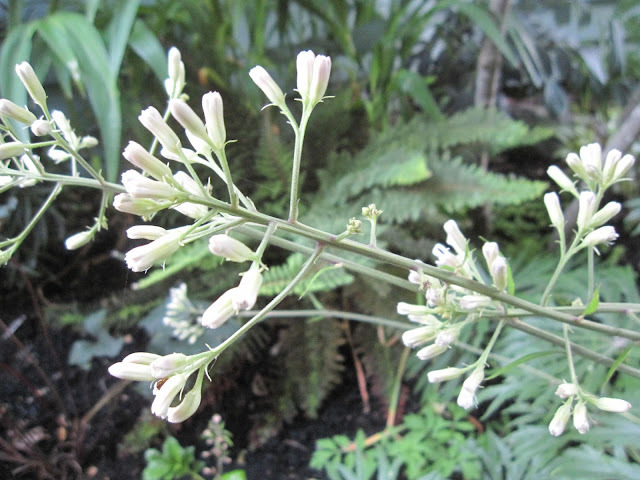 These little flowers are a sweet, crisp contrast to the gold-tinged blades. 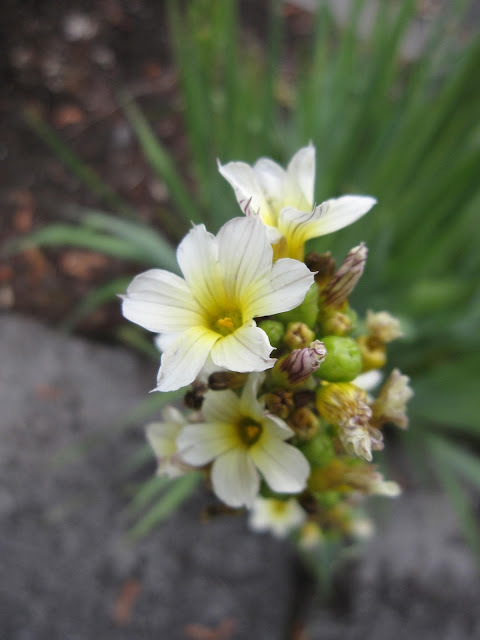 After almost dying out, some small clumps of pale yellow Sisyrinchium striatum are now thriving in the garden. 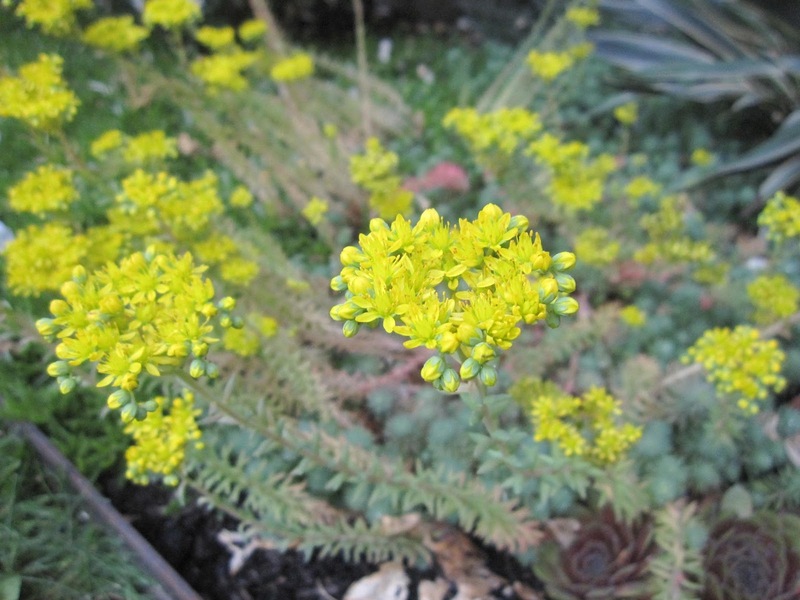 Moving into bright yellow, all the Sedum rupestre are getting into the blooming act. 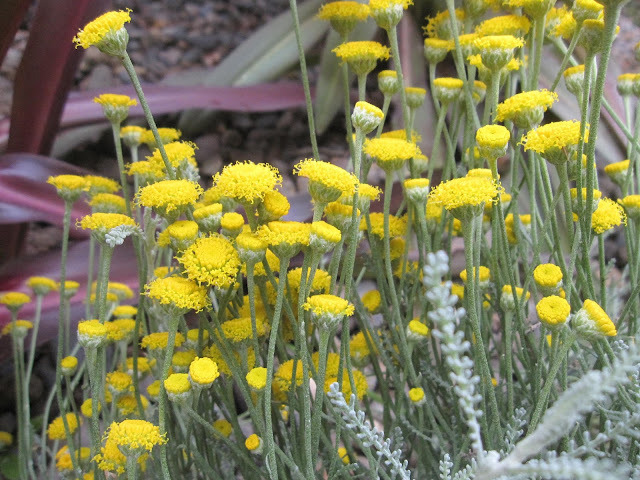 Helichrysum angustifolium has such tidy little button flowers. 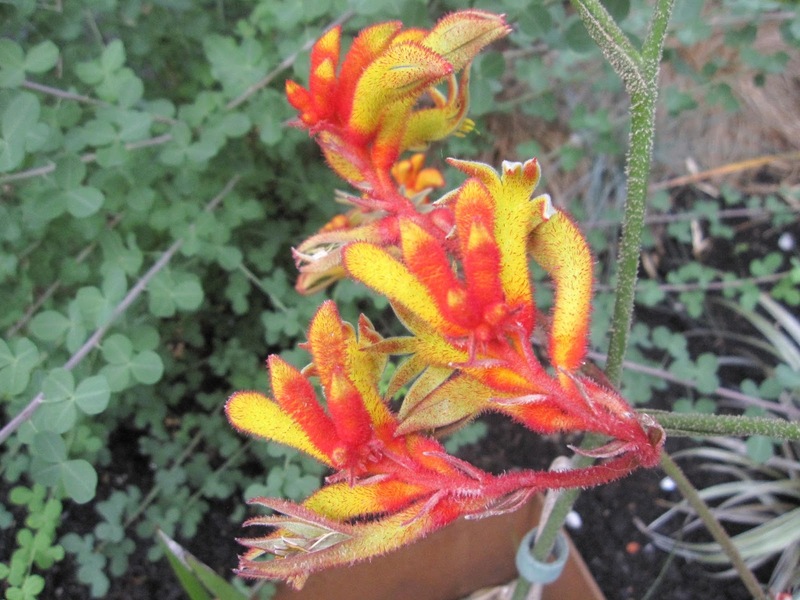 Anigozanthos 'Amber Velvet' is an annual, but the color is perfect. 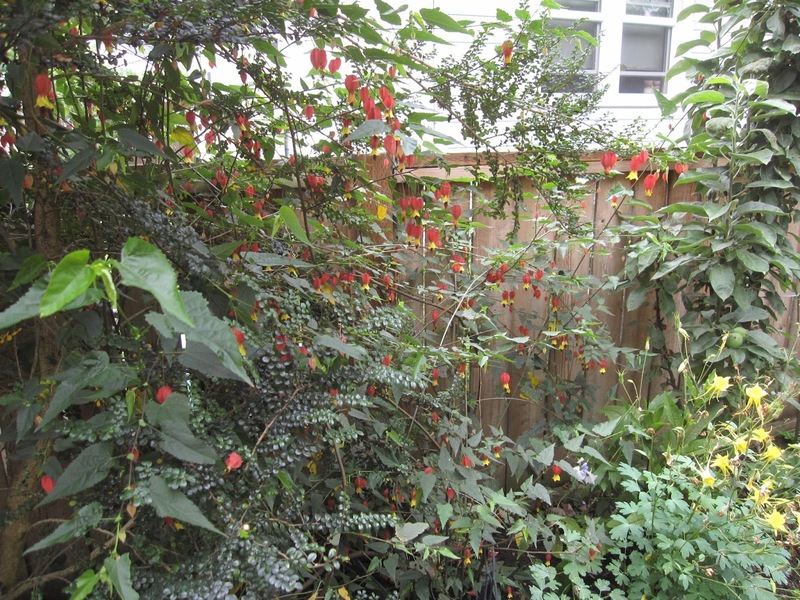 Punica granatum 'True Dwarf'' hasn't quite hit its stride yet. 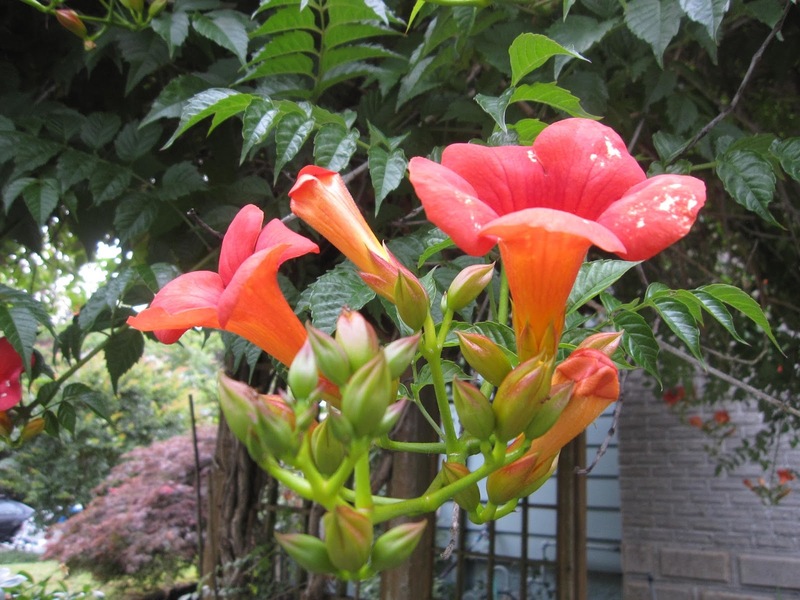 I expect this and many more of its orange flowers to open as summer heats up. 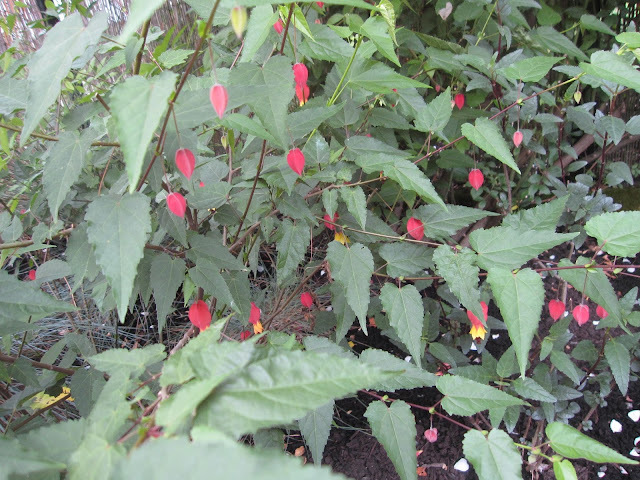 Abutilon megapotamicum lounges comfortably in the back of a bed. 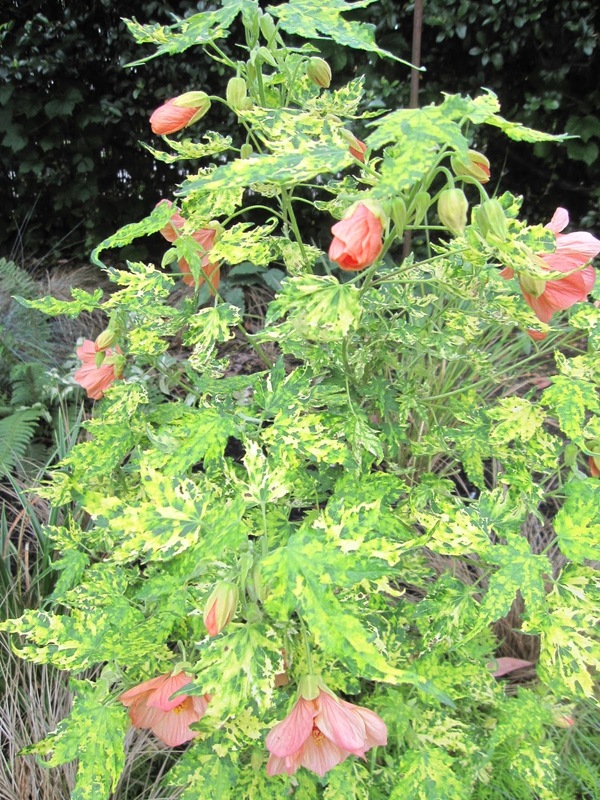 Abutilon 'Tangerine' survived last winter planted out in the garden. 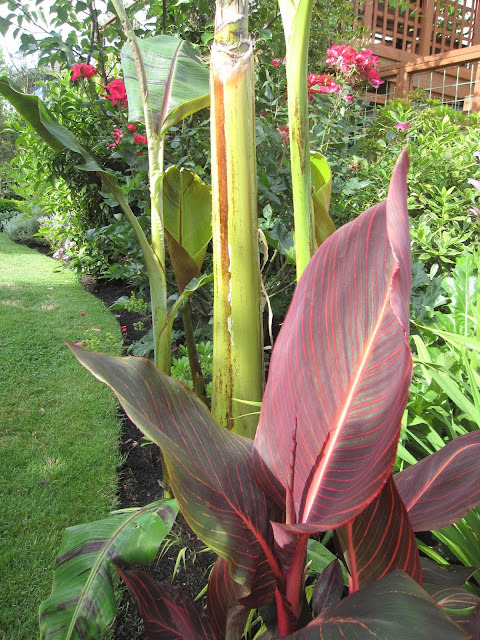 That tells you how mild it was. 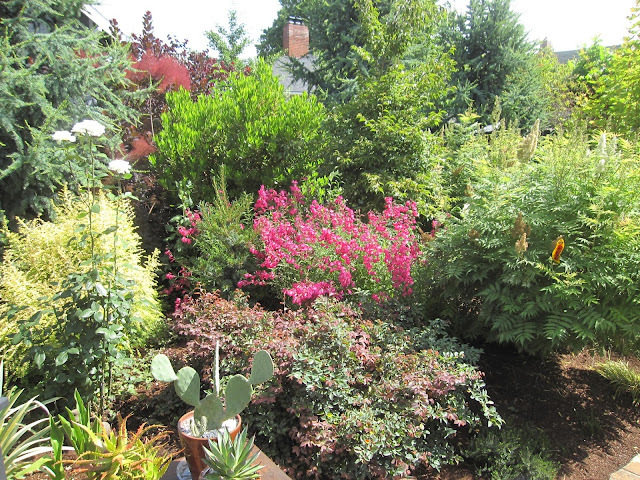 My neighbor's Bignonia creates a delightful borrowed view. 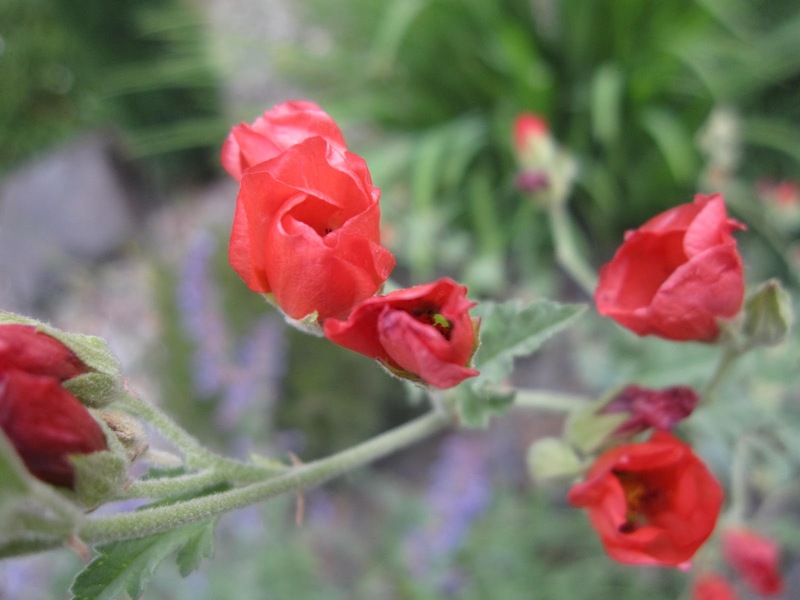 Sphearalcea 'Newleaze Coral' is blissful in a south-facing bed. 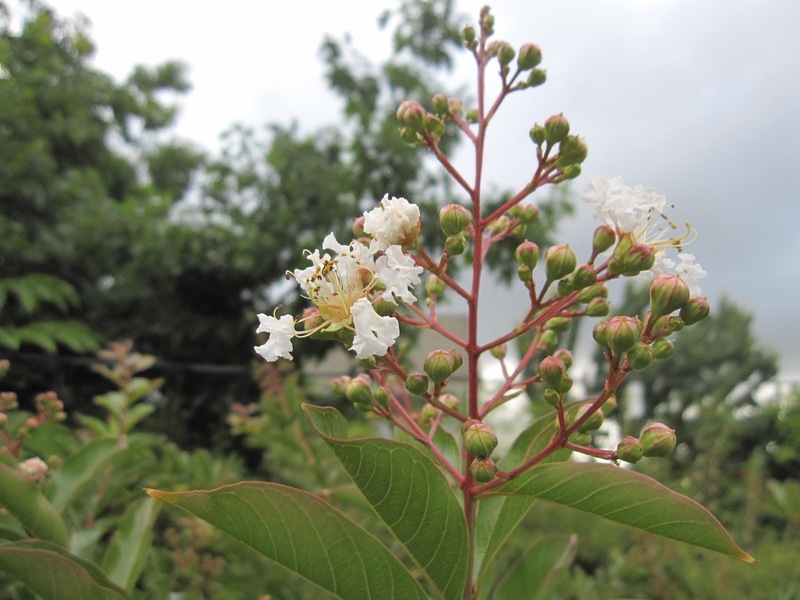 The blossoms open wide in the sun, but not so much today. Because I favor orangy-red, Callistemon 'Woodlanders Hardy Red' is the bluest red I grow. 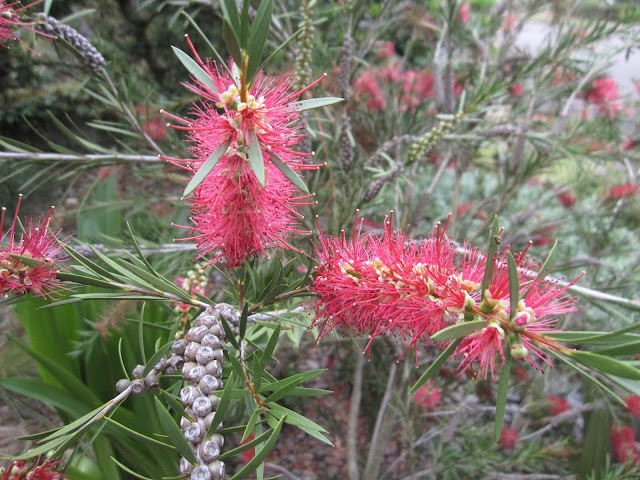 Those happy bottlebrush flowers have just kept on blooming this year. 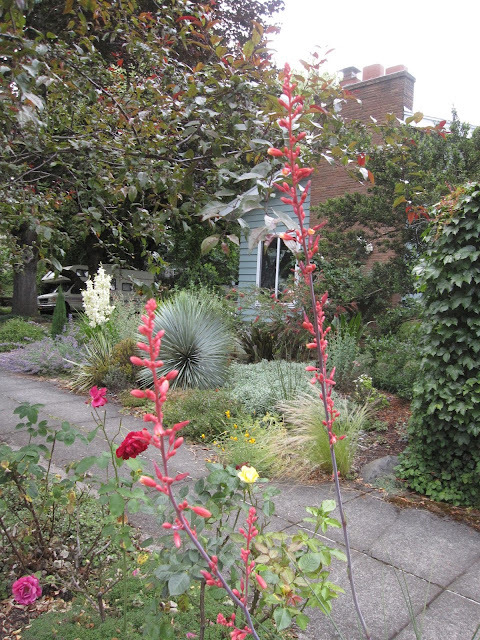 Moving into the pink range, Hesperaloe parviflora loves life on the edge - my parking strip, to be exact. 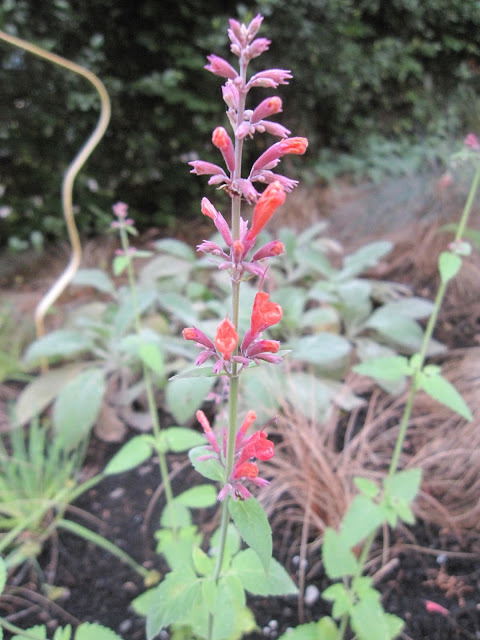 Agastache 'Acapulco Orange' is this year's replacement plant for the ones I have loved and lost over the years. They may not be long lived, but I keep putting them in because I adore the color. 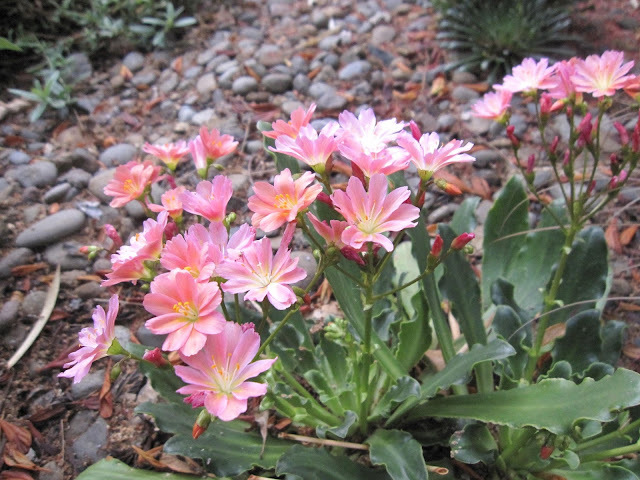 Lewisia cotyledon 'Sunset Series' is putting on a second bloom. 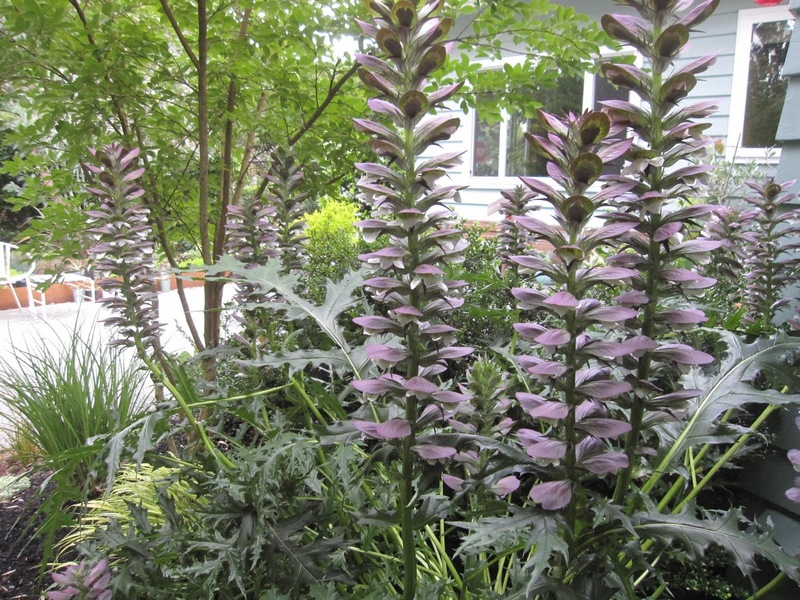 What a nice surprise! 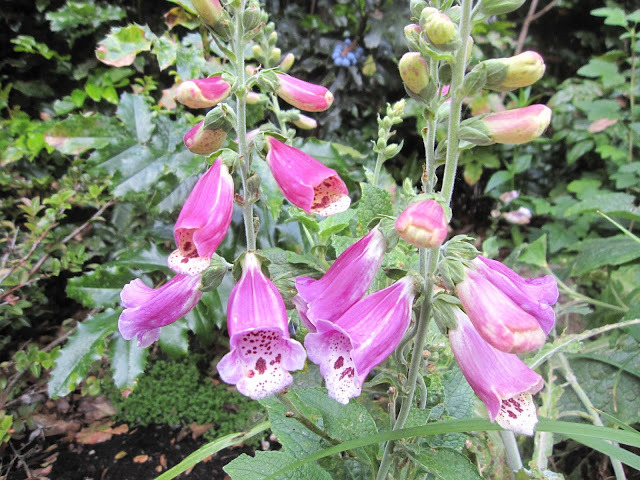 More NW Territory Digitalis, now in pinky-purple. 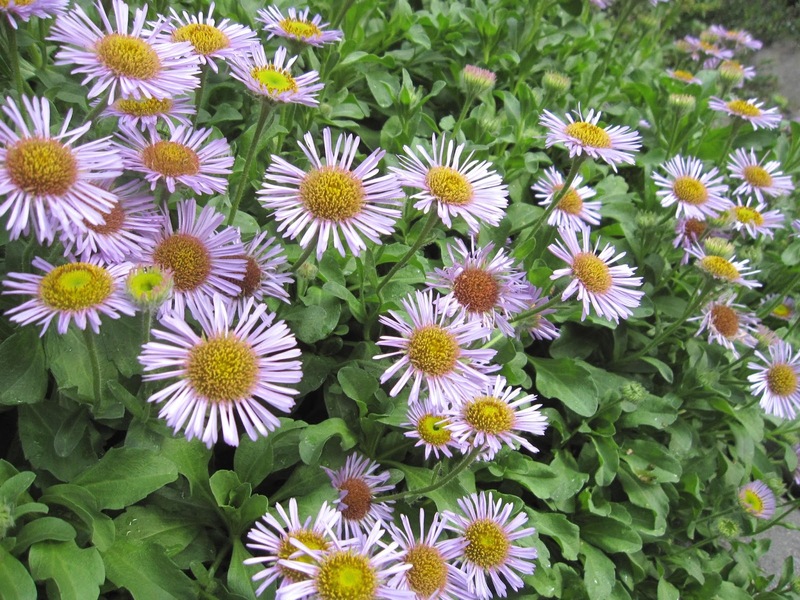 The lilac coloring of Erigeron glaucus, Beach Daisy, leads us into purple. Acanthus spinosus dominates this bed. 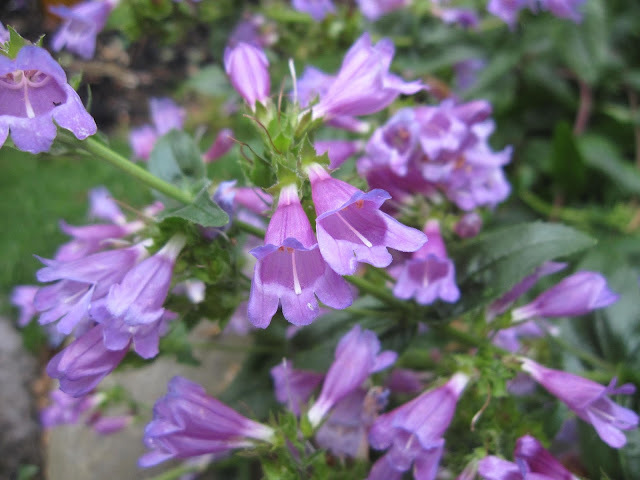 The bees and hummingbirds have been enjoying this native Penstemon (possibly P. subserratus). 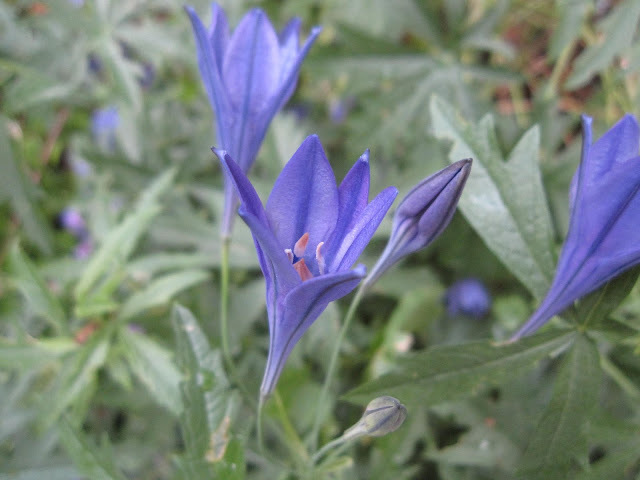 I love the deep, rich blue of Triteleia laxa 'Corinna'. The foliage of Eryngium planum 'Jade Frost' has long since reverted from its varied coloration, but it blooms reliably each year with metallic blue flowers. 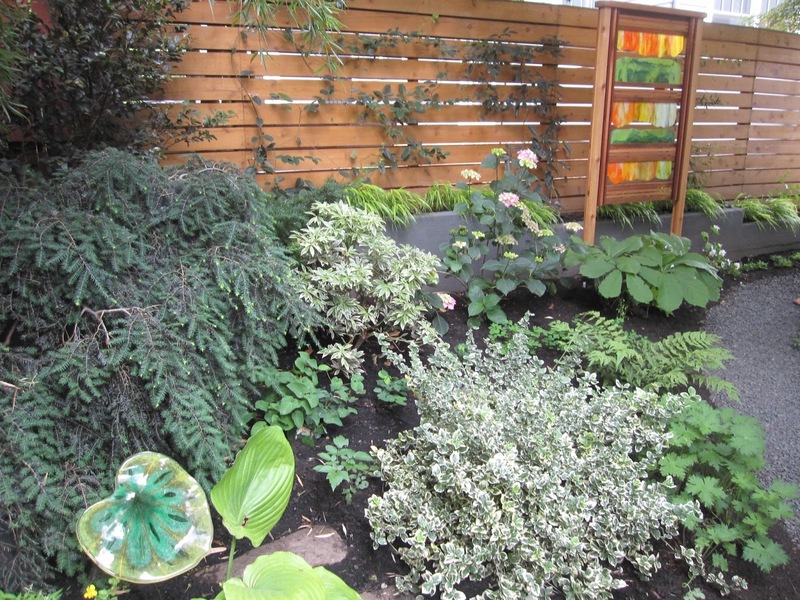 For now, it's still green and it rounds out our color exploration. Bloom Day is hosted monthly at May Dreams Gardens, where you can see flowers from all over. Coming up: the 2016 ANLD garden tour - with a giveaway! 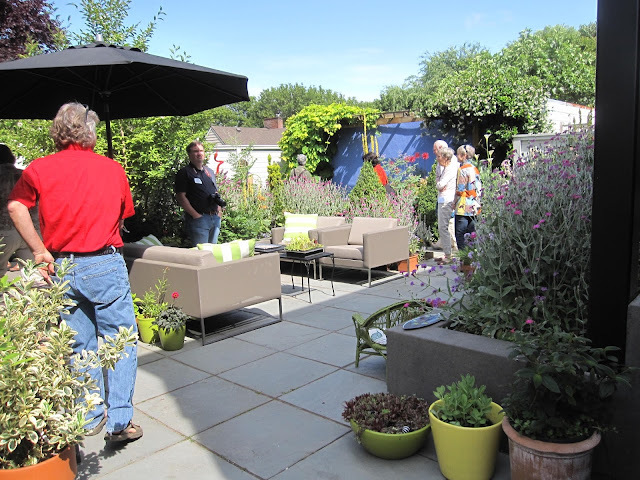 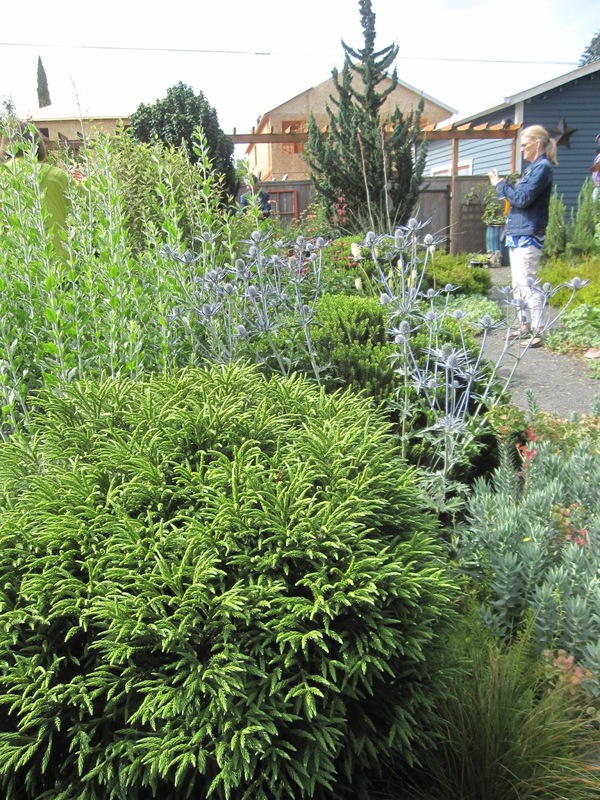 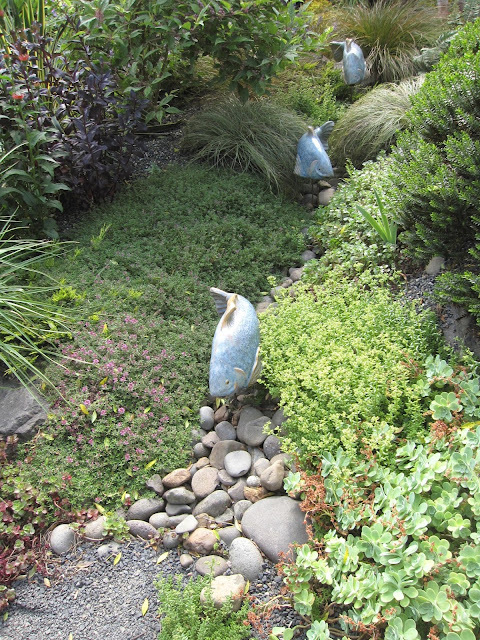 The Association of Northwest Landscape Designers (ANLD) hosts an annual tour of Portland area gardens, and I was lucky enough to be invited to the pre-tour event. 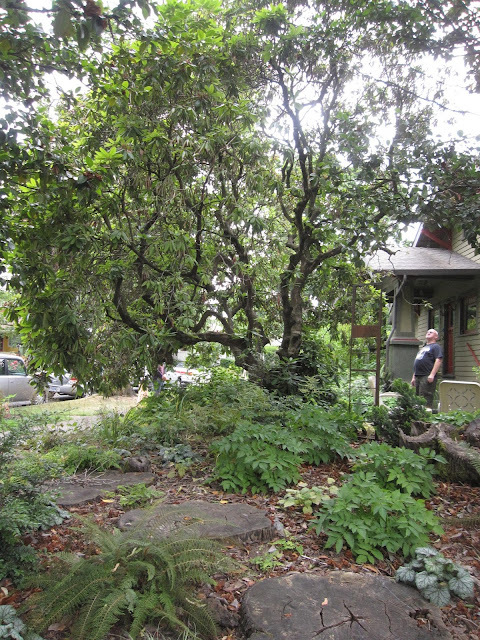 For your calendar, the actual tour is coming up on Saturday, June 18th this year. 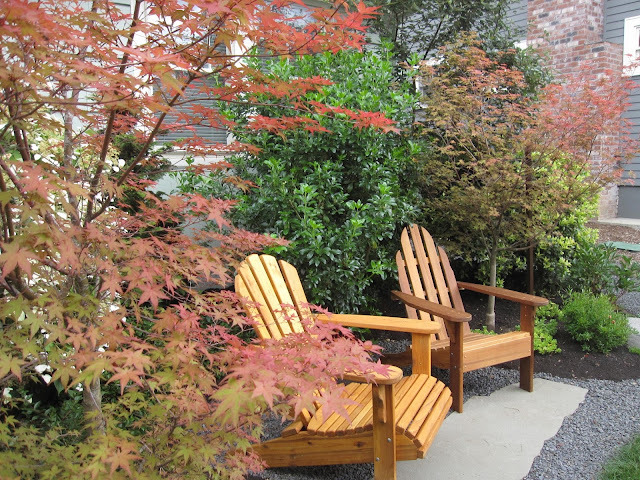 The Designers Garden Tour is a great introduction if you're thinking about hiring a landscape designer. 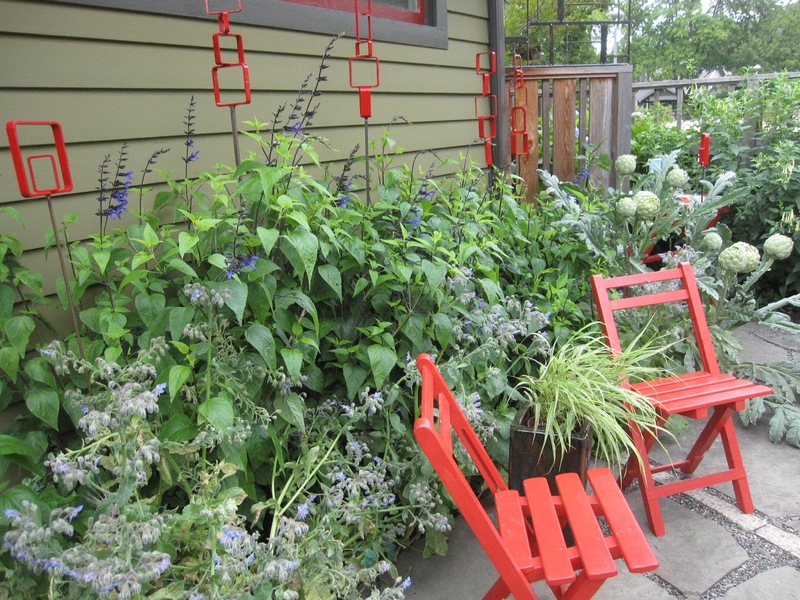 It's also perfect if you're looking for creative ideas for solving your own garden challenges. 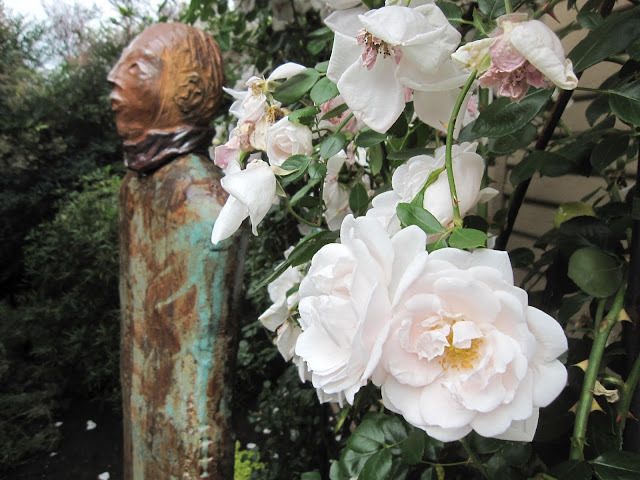 And if you love to see art perfectly placed in a garden, or if you just enjoy walking through beautiful and intriguing gardens, the ANLD tour is for you. 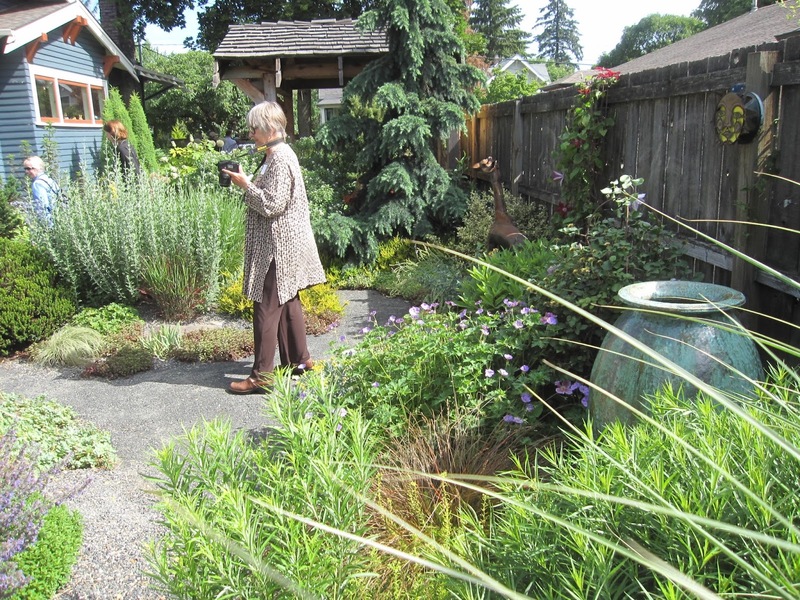 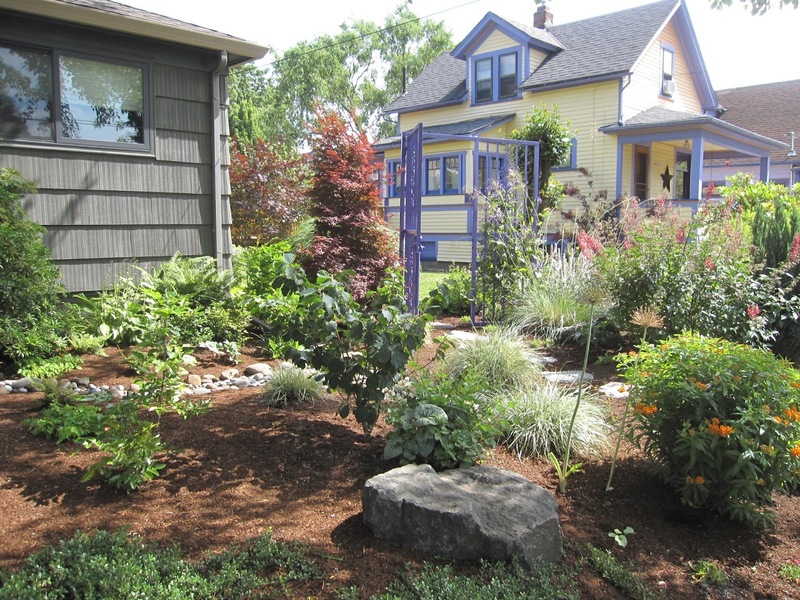 This year's tour of seven lovely gardens is on Portland's east side. 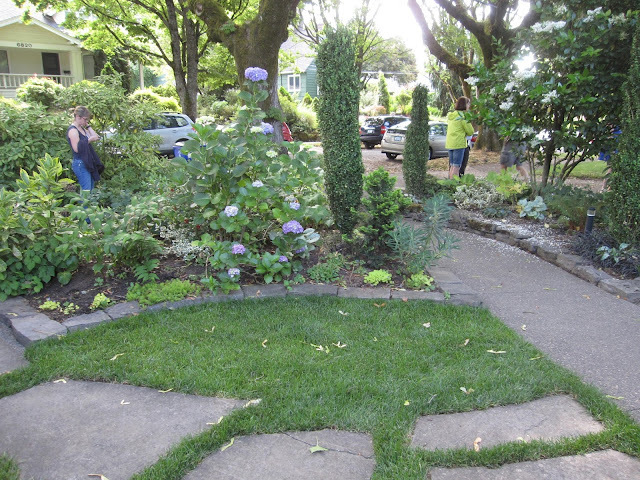 Here's your sneak peak, with a giveaway at the end. 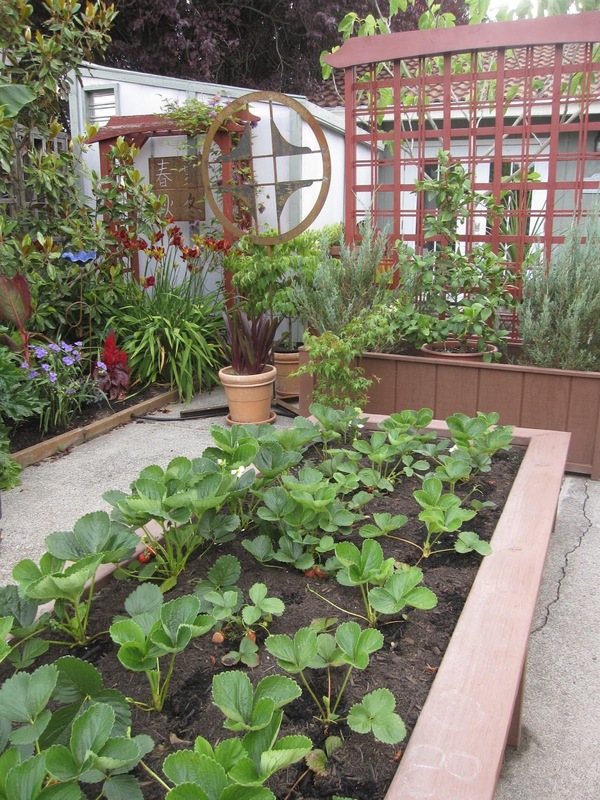 Garden #1. The Wagner garden is a tranquil, Asian-inspired retreat, with year-round interest and a lush plant palette. A sitting area away from the house is a little oasis in the garden setting. A gentle water feature adds to the quiet, meditative feel. 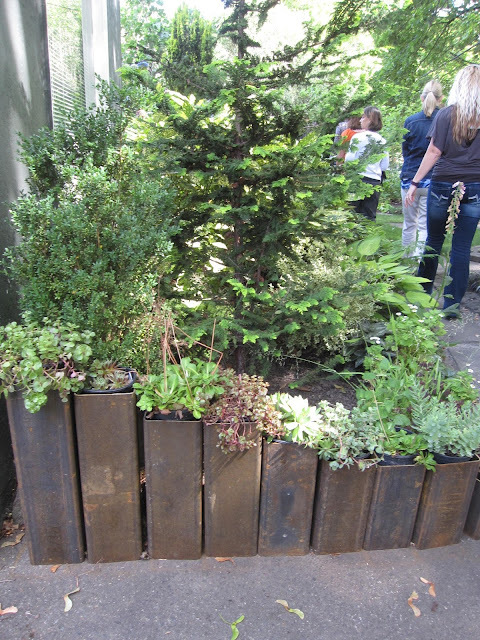 In what was the driveway, the designer has added raised beds and structures to further separate the quiet back garden. 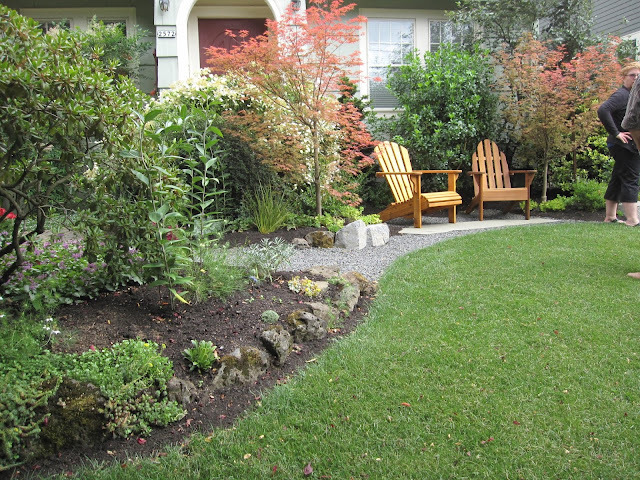 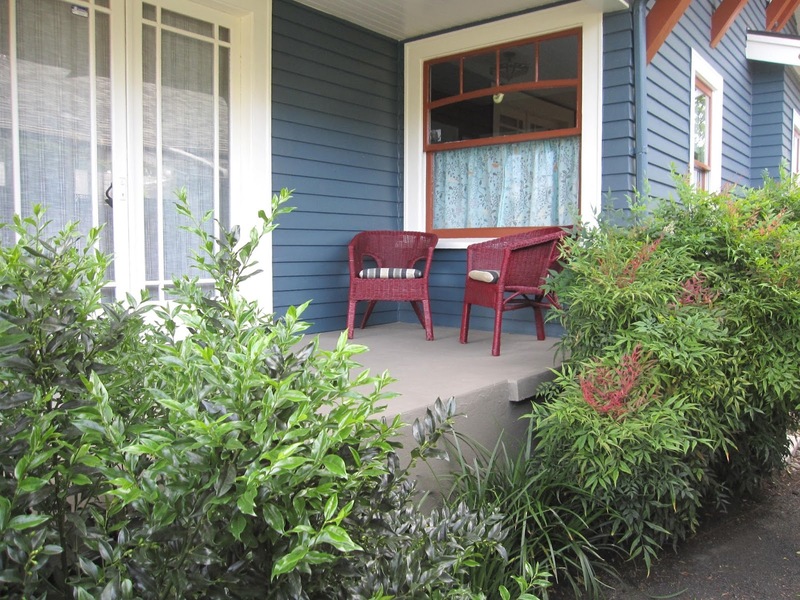 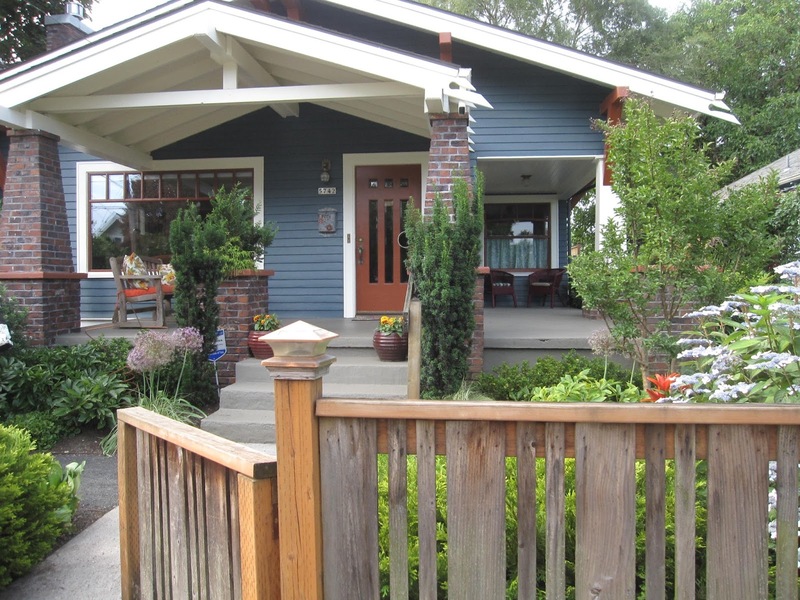 Simple plantings enhance the bungalow's wrap-around front porch. 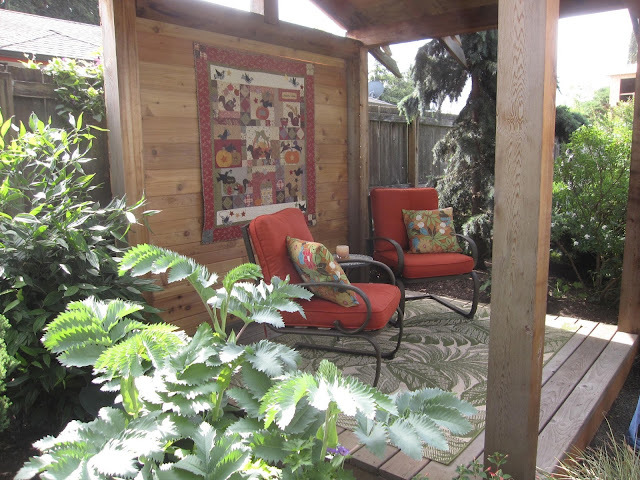 Halfway along the side, a summer house invites you to enjoy the garden and the diverse sun-loving plants. 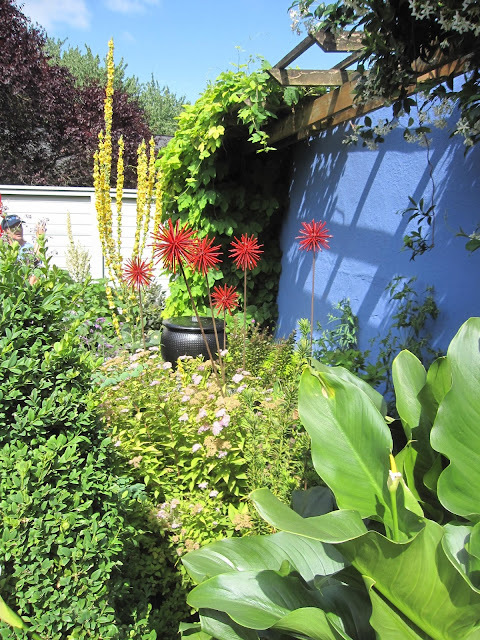 The main part of the back garden continues the sun-kissed theme. 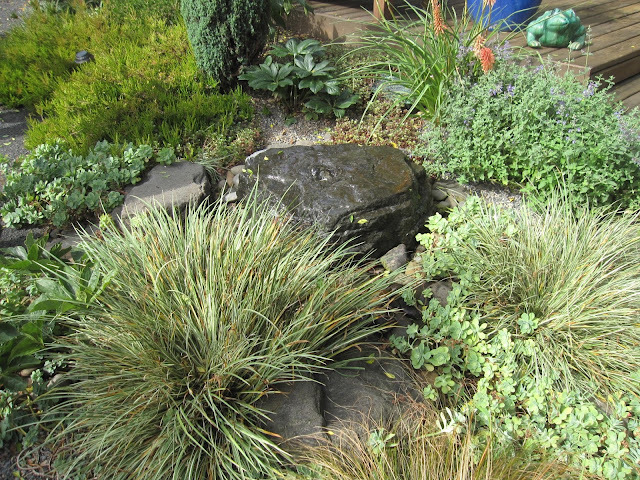 A burbling rock fountain adds the perfect water note between grasses and other xeric plants. Garden #3. 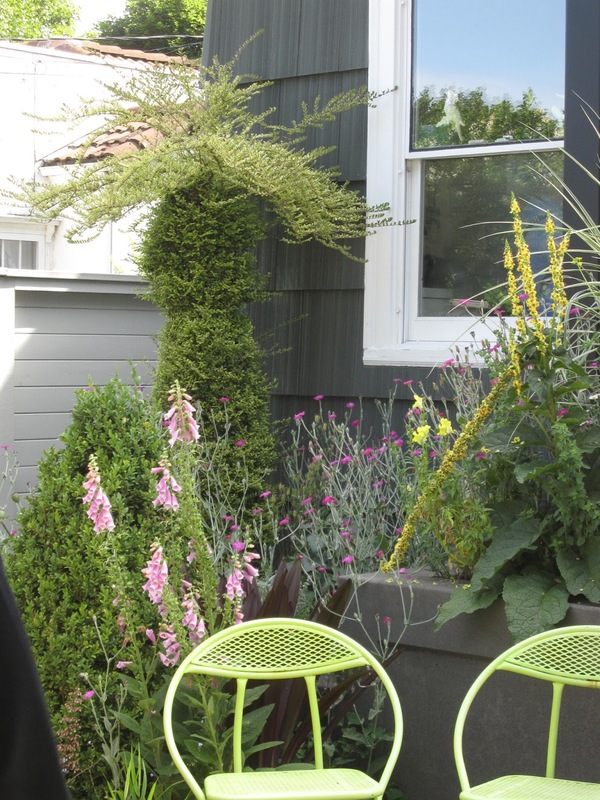 The Hannan garden is a designer's own indulgence. She freely admits this is not a garden she'd design for a client, but it's delightfully personal and compelling. ... gives way to a colorful and precise yet softened back garden and patio. "Granny" plants and fun are unabashedly featured in this garden. 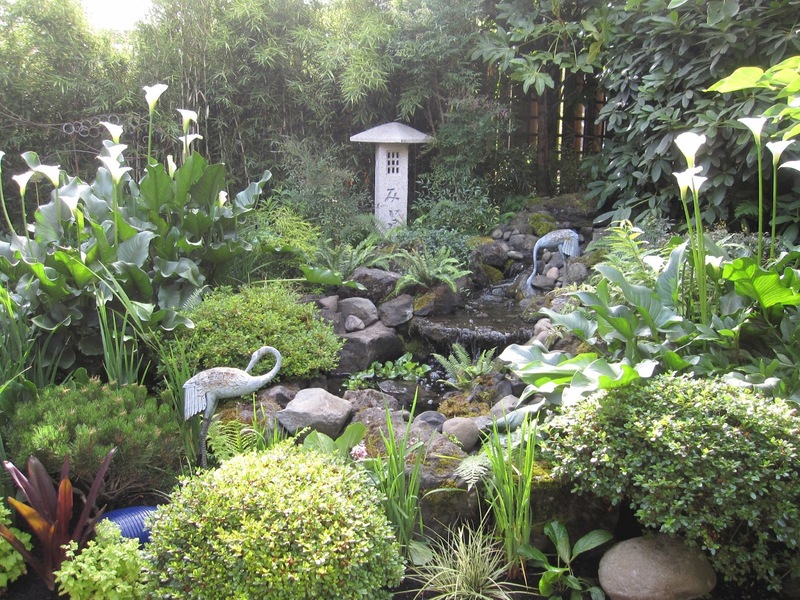 Garden #4. 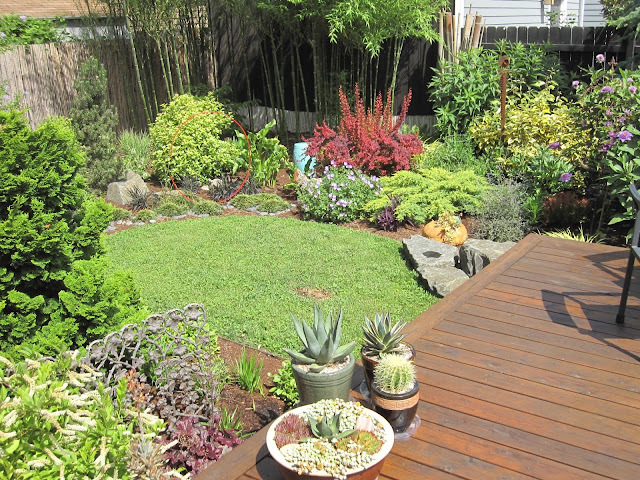 The King garden re-invigorates the spaces around a mid-50s ranch house. 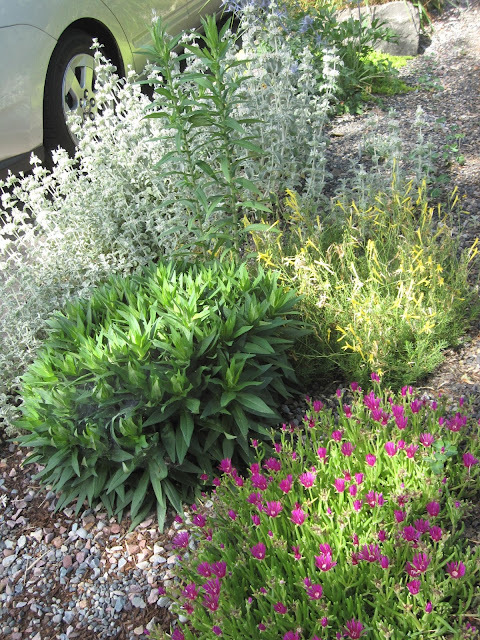 The parking strip is full of colorful, water-saving plants. The seeded back yard "Dog Park Eco-Lawn" caters to the owner's sweet elderly Lab. 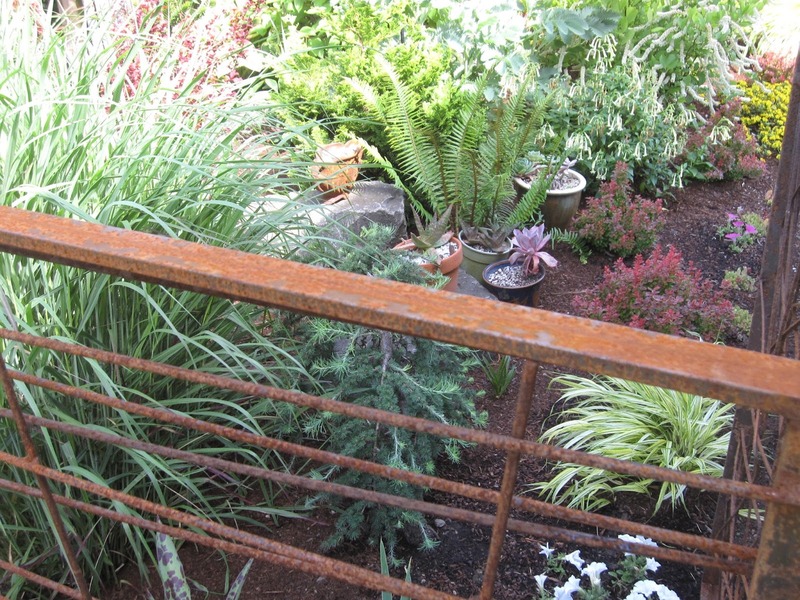 Custom fencing and metalwork provide interesting transitions. 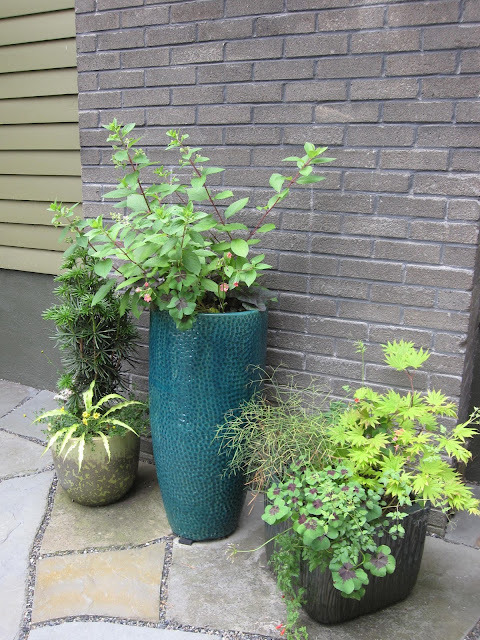 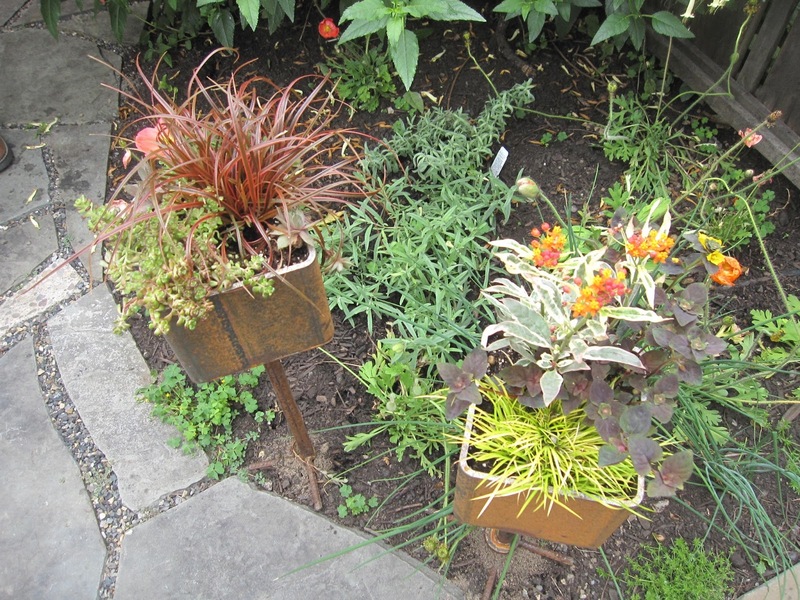 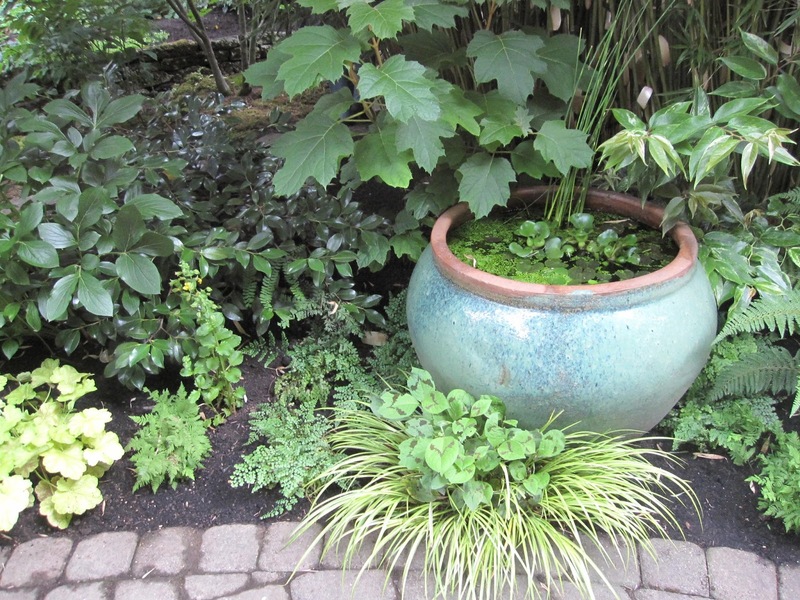 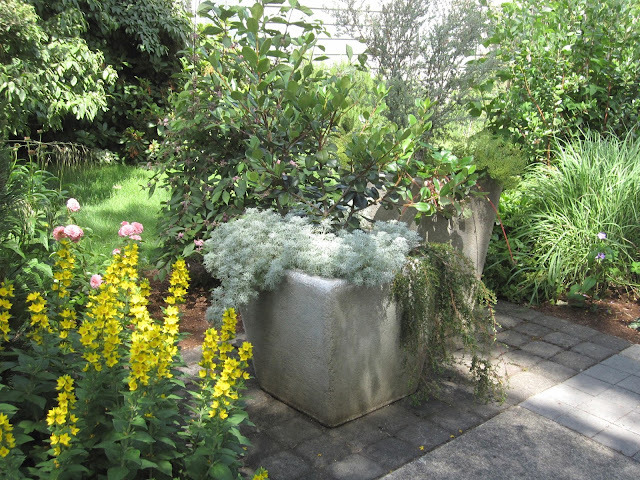 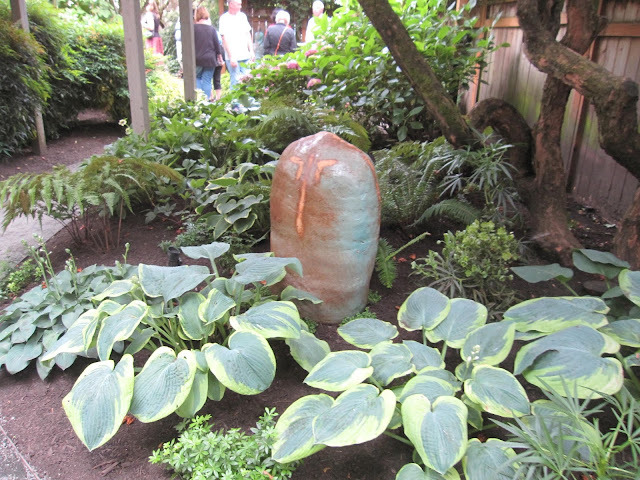 Great containers holding choice selections punctuate the plant narrative in this garden. 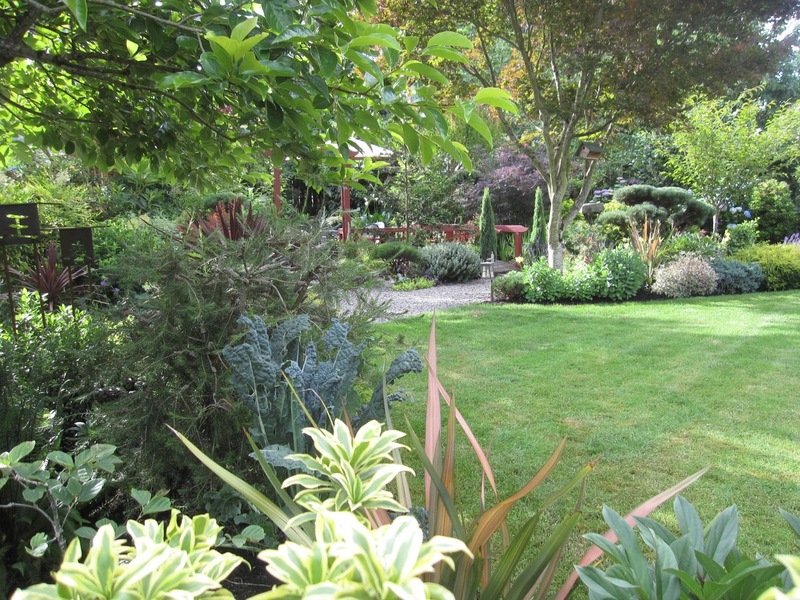 Garden #5. 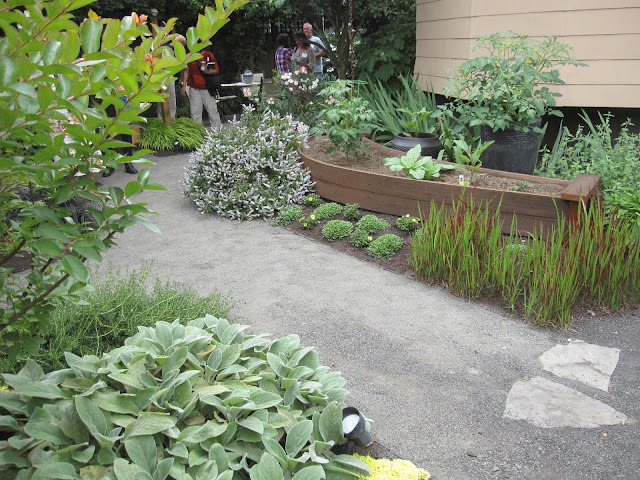 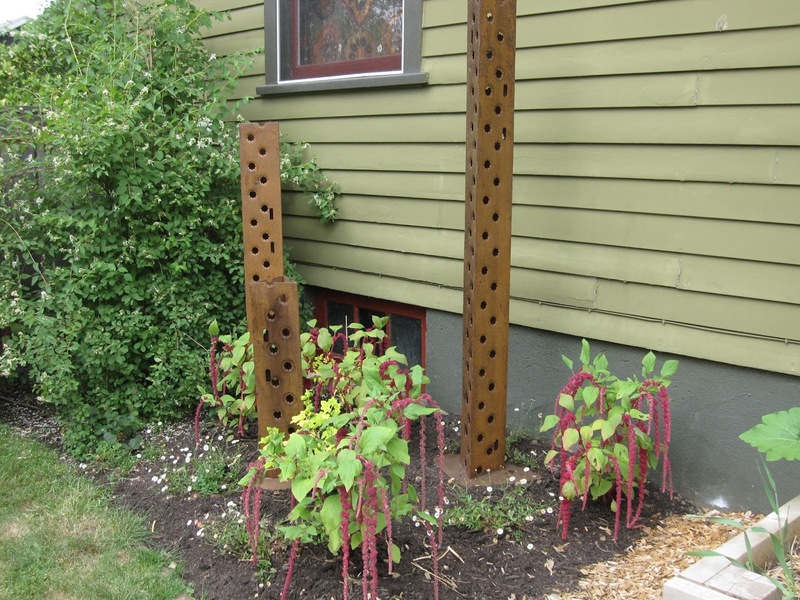 The Ohlson garden is designed to support pollinators, wildlife and soil health. The challenging lot location and Ladds Addition covenants called for sensitive fencing decisions with community input. Plant and flower choices echo the adjacent rose garden. 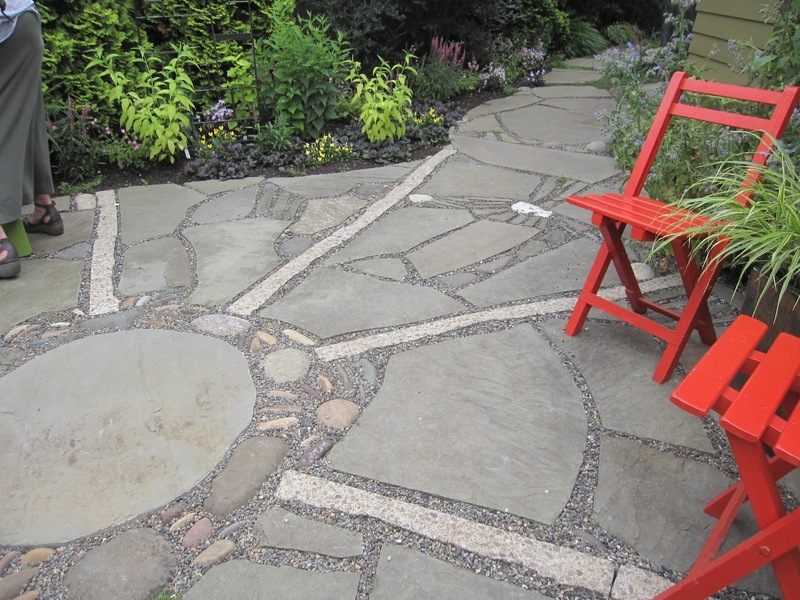 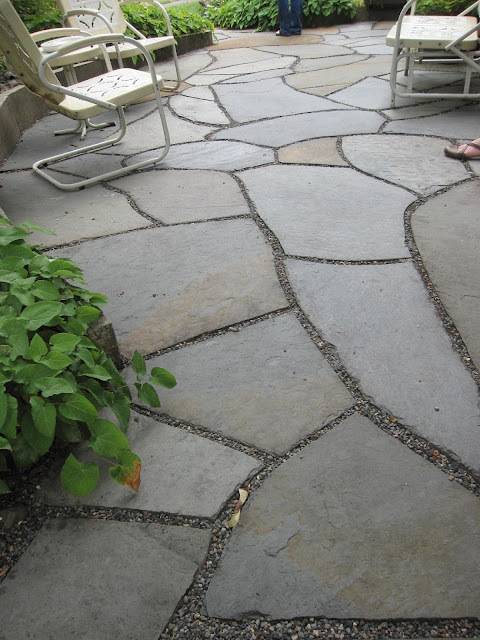 Paver patios in the front and back gardens allow water to filter back into the soil. 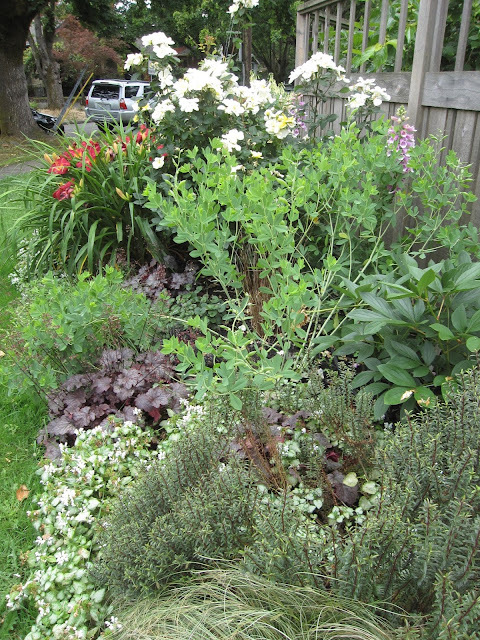 Small plantings are equally as important as the large swaths of foliage and flowers. 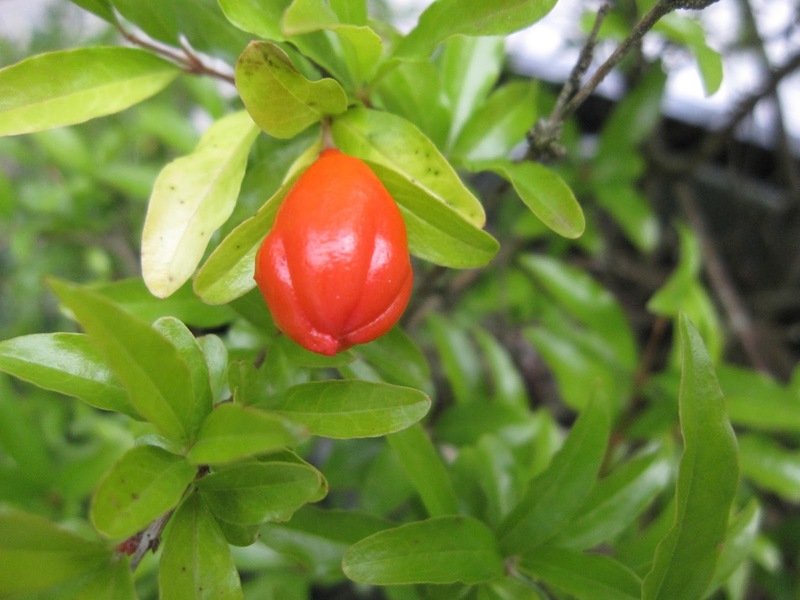 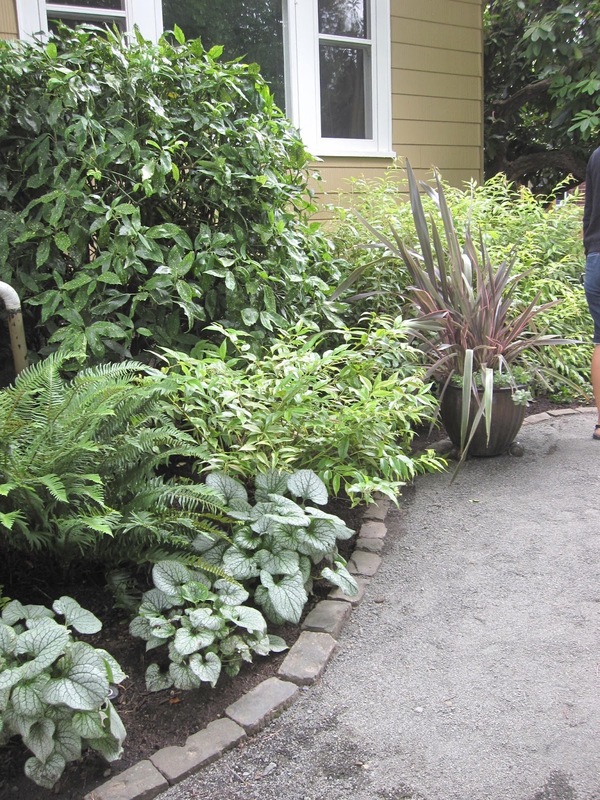 Edibles appear in beds alongside ornamentals, and also have a designated place on the west side of the house. Azara microphylla makes a fine privacy screen and supports the blooms of a large Abutilon megapotamicum that languishes along one side. Garden #6. 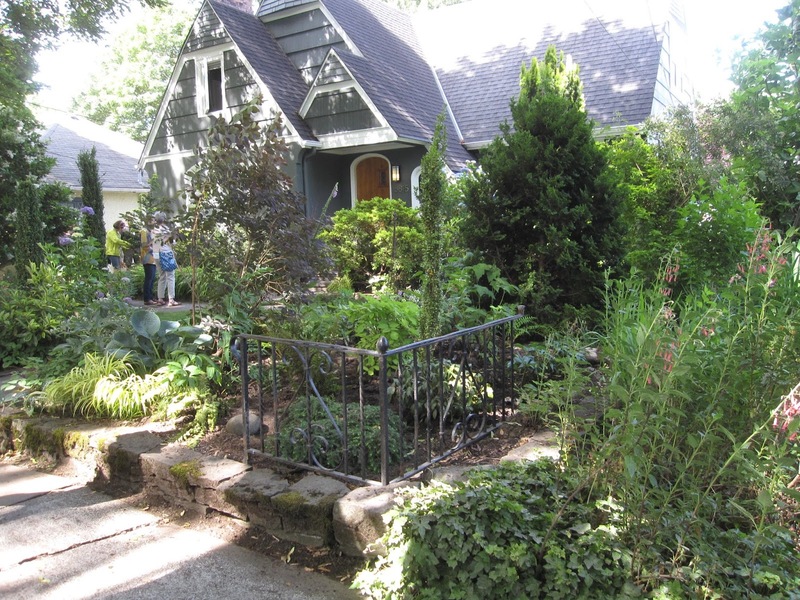 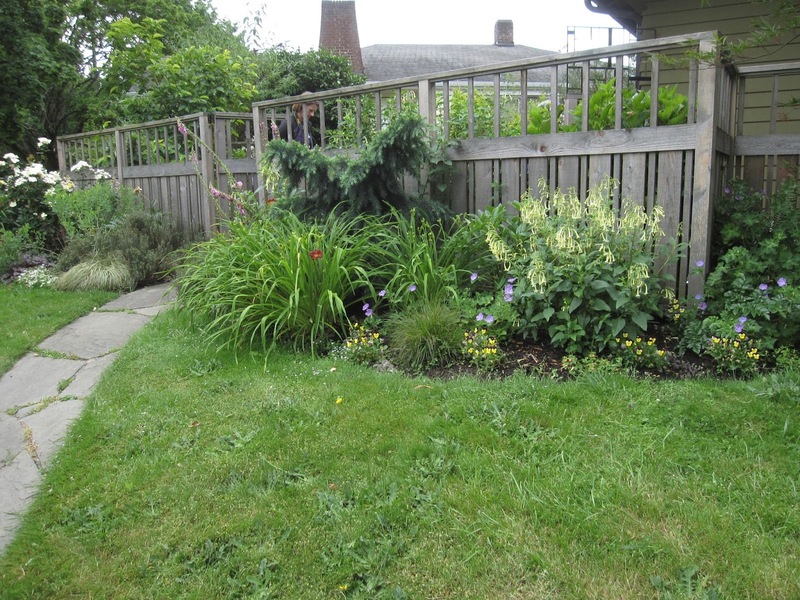 The Bebernes-Gawf garden is an open, welcoming front garden with a hidden refuge in the back yard. 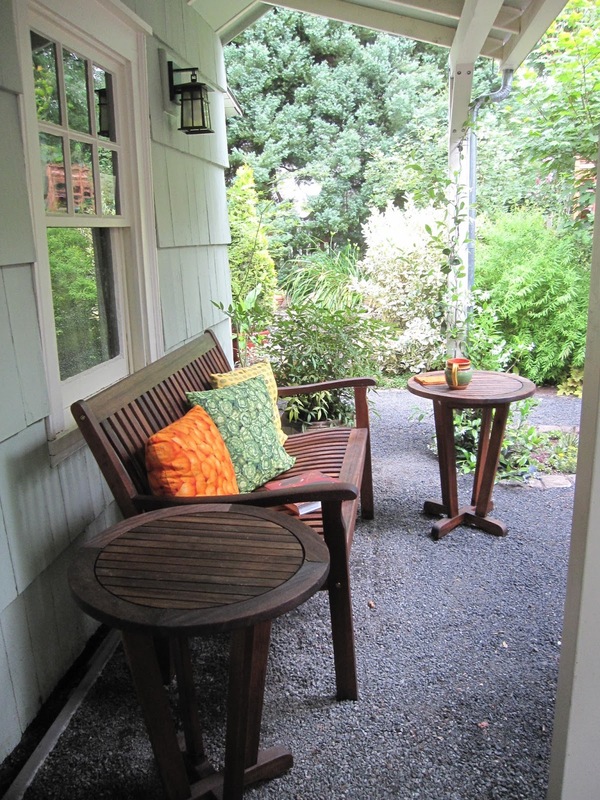 The newly-created sitting space in the front allows for neighborly conversations. 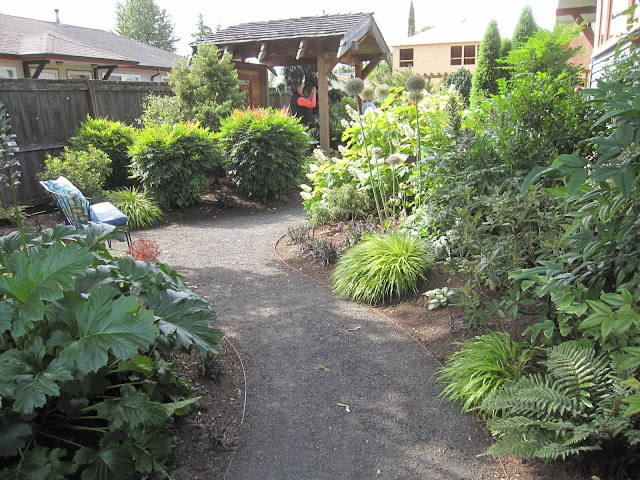 Down the driveway and into the back lies the quiet, cool alternative. The stunning glass pieces came from Garden Art by James, some made specifically for this garden. A porch built off the garage has become the perfect place from which to enjoy the back garden. 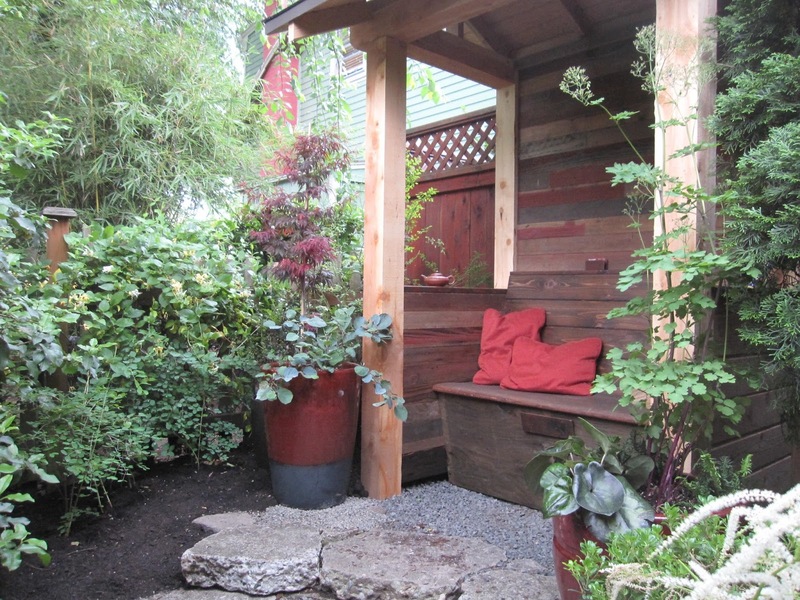 A small moss garden leads to a tiny tea house finished in reclaimed wood. 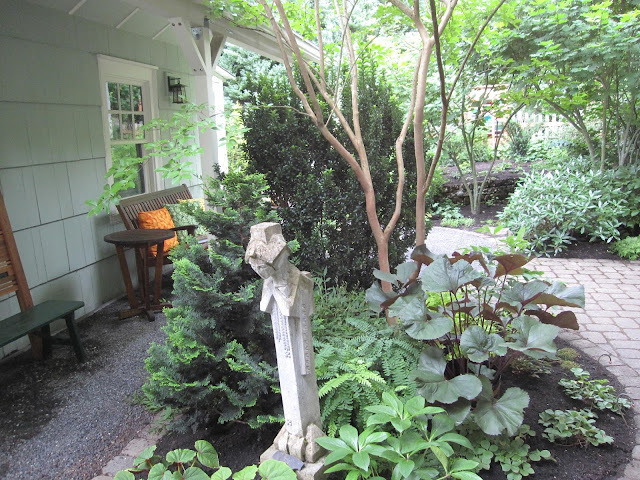 Garden #7, the Mauch garden, was designed to adapt with its owner and to accommodate an anticipated addition to the house, now completed. The curving veggie bed echoes the shape of the sun-room addition and allows the owner to garden sitting down on the end benches if she wishes. 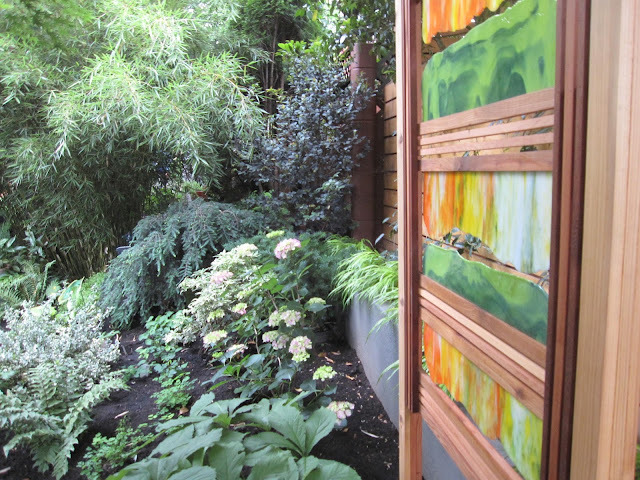 Even a narrow side yard adds beauty and sound in this garden. 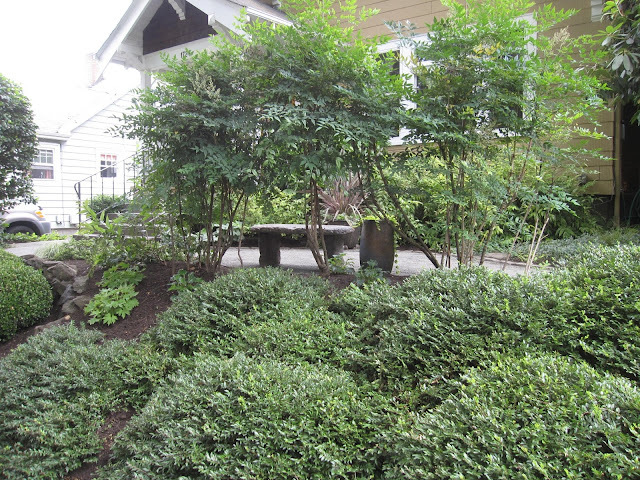 In the front garden, gentle pillows of a prostrate Lonicera front the sidewalk and separate it from the path seating and plants. 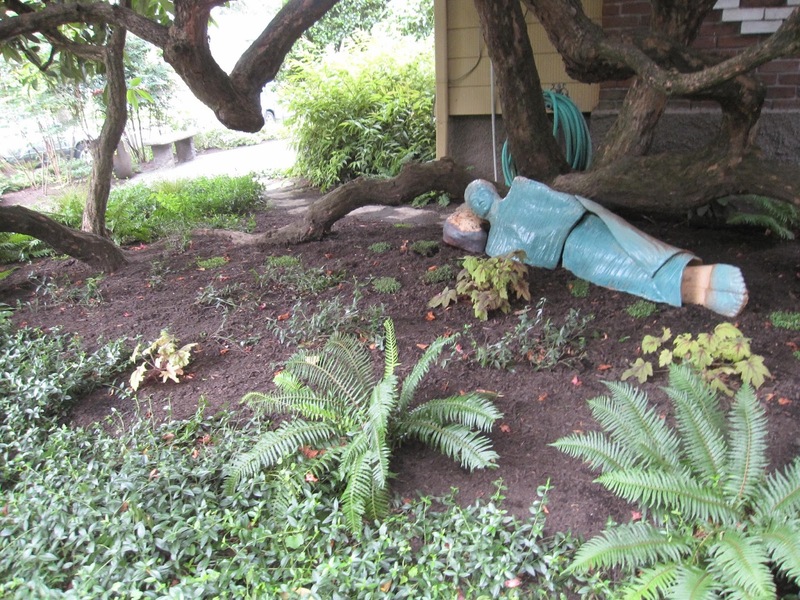 Sculpture by Katie McFadden is placed throughout the garden; here it's sheltered by a magnificent old Rhododendron. 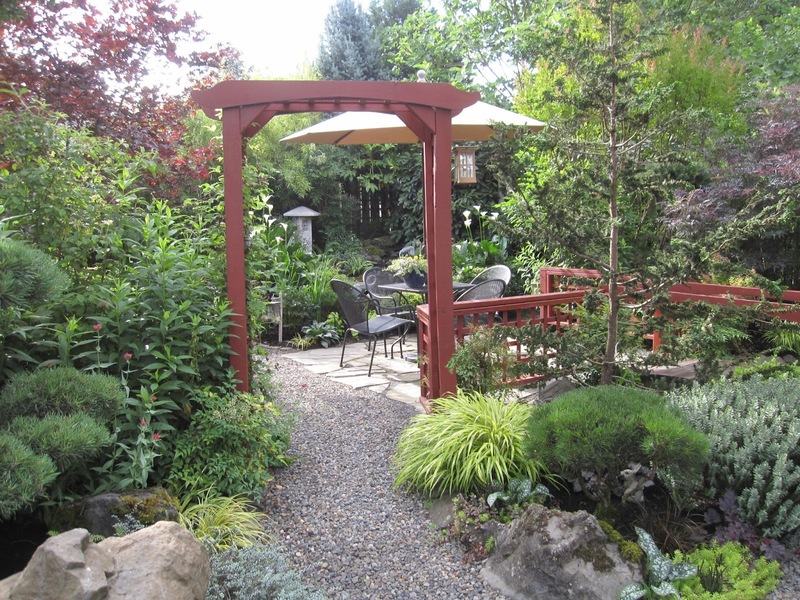 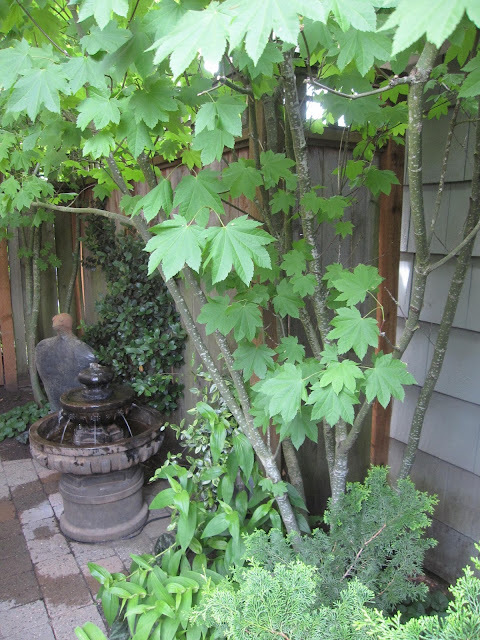 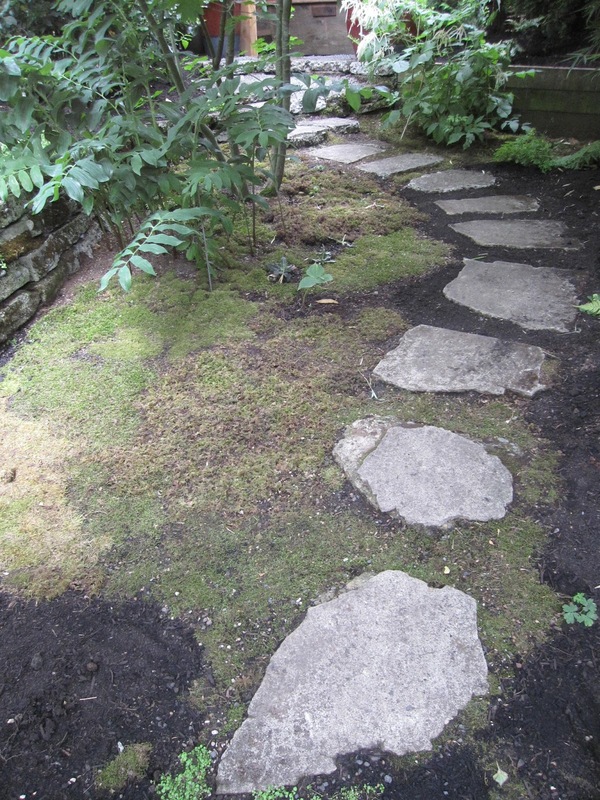 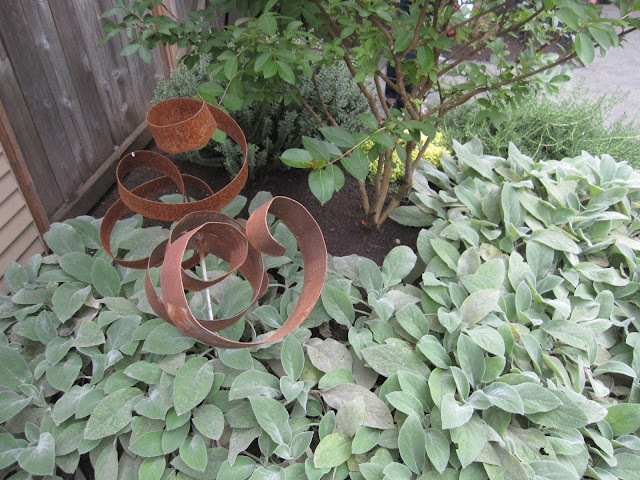 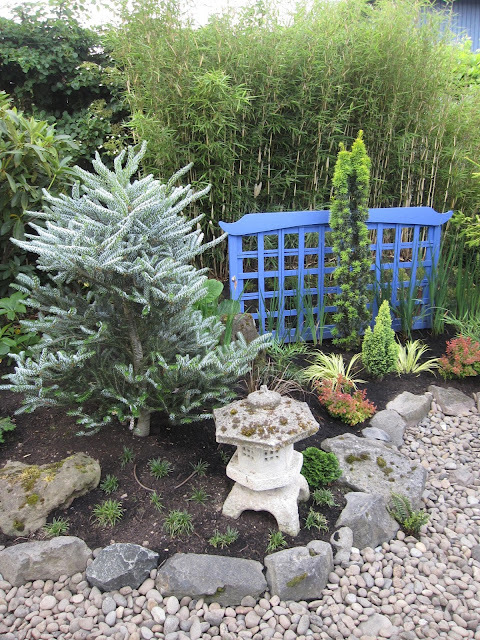 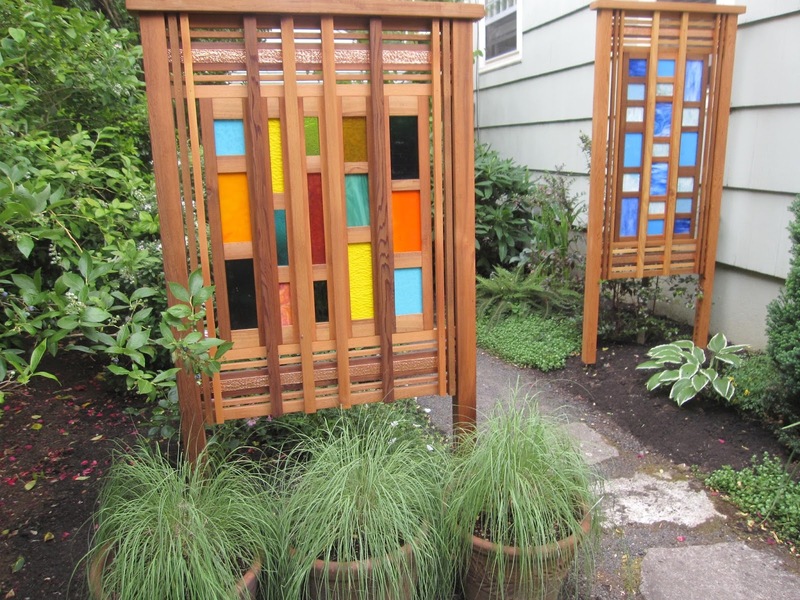 The Designers Garden Tour is Saturday, June 18th from 10am to 4pm. 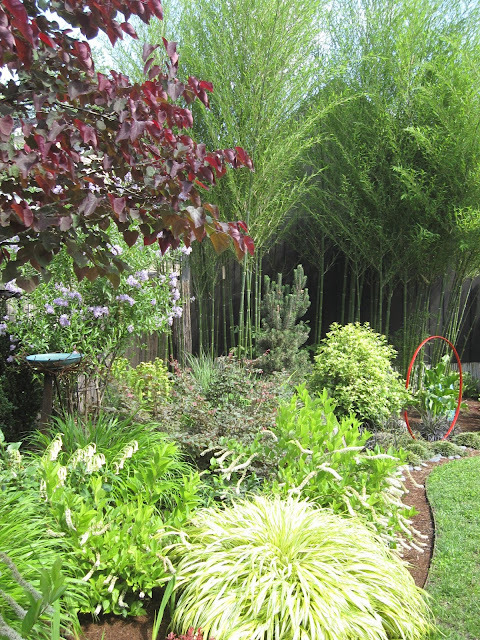 Tickets can be ordered online from ANLD here, or bought directly from Garden Fever, Portland Nursery, Al's Garden Center (Sherwood only) and Cornell Farms. 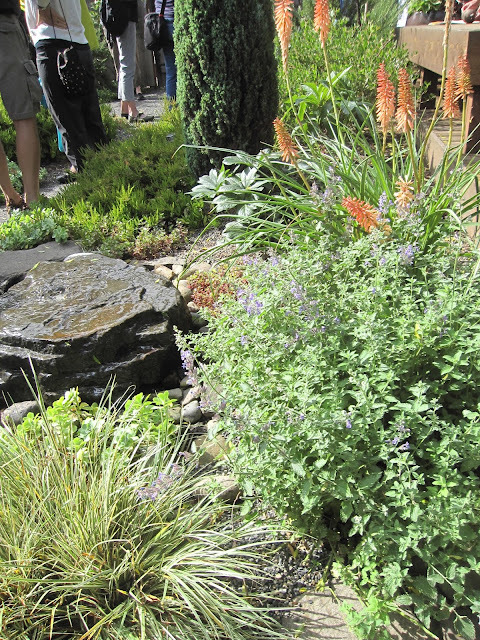 Proceeds benefit the ANLD scholarship program for aspiring landscape designers attending local community colleges. I'm giving away one $25 ticket for the tour free: Just leave a comment on this post and say you'd like to have the ticket. 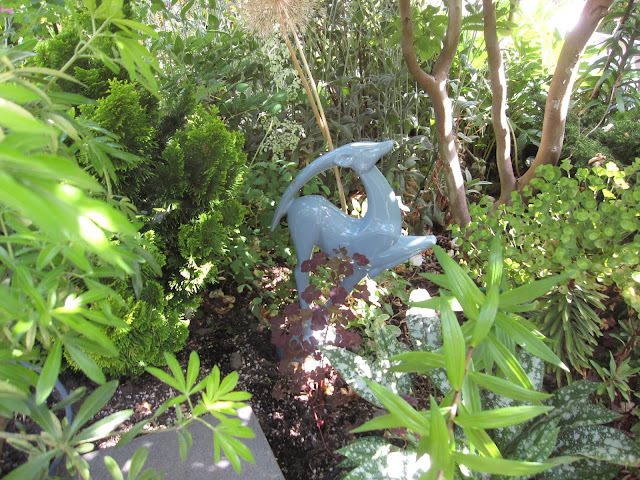 I'll draw a random name on Saturday, June 11 and let the winner know.